Help brighten the holidays of JFCS clients and community members who otherwise would not be able to observe Hanukkah and other holidays due to frailty, disability, economic hardship, and other challenges in their lives. Volunteer with your children to assemble and deliver holiday bags filled with festive food and goodies for hundreds of JFCS clients. This is a wonderful volunteer opportunity in which the entire family can participate. Help brighten the holidays of JFCS clients and community members who otherwise would not be able to observe Hanukkah and other holidays due to frailty, disability, economic hardship, and other challenges in their lives. Volunteer with your children to assemble and deliver holiday bags filled with festive food and goodies for hundreds of JFCS clients. This is a wonderful volunteer opportunity in which the entire family can participate. The Friday assembly opportunity is geared towards families with school aged children, this event includes a special Shabbat program and after-school snacks. Help Jewish Family Services of Silicon Valley (JFS SV) make Hanukkah brighter for those in need. JFS SV invites you to be a part of our 10th annual Embrace-A-Family program which brings hope and smiles to those in need. Your gifts will help ease holiday pressures and stress for needy families, senior citizens, and adults. Frail, isolated seniors are often overlooked at this time of year. Providing gifts for them is a special mitzvah that will make a huge positive difference in their lives. Your gift will bring a smile - and be a blessing - to someone in need. Look for JFS SV dreidel boards in the community from now through December 19. Select a gift dreidel from the board, purchase the gift listed, and bring your unwrapped gift to the JFS SV office at the Levy Family Campus. Gifts can also be purchased online. Ages: Everyone is welcome to participate. There are volunteer opportunities in late November and December for children 10 and up with their parents. Contact: Lori Cinnamon, Manager of Community and Volunteer Engagement, 408.357.7467 or loric@jfssv.org. Volunteers are also needed to help create and stock dreidel boards, greet donors, wrap gifts and more. This holiday season, kids can help the Food Bank make the holidays brighter for their neighbors in need. Prepare an at-home family project or youth group project and bring to any of the three Food Bank locations. Once you choose an activity, fill out this form and bring it with you when you come to drop off your donation. Create colorful grocery bags for our seniors with glitter, color crayons, holiday themes, etc. Create lunch bags - including nutritious menu items such as: Cheese & cracker packets, 100% juice boxes, granola bars, nuts, dried fruit, pop-top cans of ready-to-eat foods such as tuna, meals in a can or fruit cocktail. Help a Mother Out (HAMO) works to improve baby and family well-being by increasing access to diapers for families in need. A family's access to a reliable supply of clean diapers reduces the risk of infectious disease outbreaks, improves baby's health and comfort, and enables baby's participation in early care and education programs. Our vision is a day when every baby has a healthy supply of diapers. To host a diaper drive at your home, school or organization, just grab a box and go! All the materials you need can be found in our online diaper drive toolkit! Create new baby kits at home - HAMO can send you a list of materials to purchase (like diapers, board books, and a newborn care kit), assemble them at home and we can distribute to our community partners. Help us continue our ongoing efforts to increase wildlife habitat at McClellan Ranch by planting native plants, removing invasive plants, sheet mulching and this is a great opportunity to do a bit of wildlife watching and learn about our local native habitat. Ages: Volunteers of all ages are welcome; minors under 18 require a parent to approve the online waiver when registering for this event, and children under 12 require an accompanying adult unless prior approval is obtained from the workday supervisor. Contact: Jeremy Merckling, Jeremy@grassrootsecology.org, 650.419.9880. Registration is available online. If after you have registered, you find you cannot attend, please notify Jeremy@grassrootsecology.org. Adopt-A-Grandparent - Donate, Wrap and/or Deliver! Help make the holidays special for local elderly residents through a program called Adopt-a-Grandparent. Each year Ali McCarthy puts together festive gifts for elderly residents in nursing homes. (She does not make any profit on these donations). This year her goal is to provide gifts to 140 "Grandparents." Many of the residents have few if any visitors and receive little, if anything, during the holidays. That's where we all come in! By delivering the packages, we can make their holidays feel special! Each festive gift is $20, which includes Mint Bliss Energizing Lotion for Feet and Legs, Satin Lips Shea Butter Balm, fuzzy socks and a holiday card. Two days before Christmas we make the rounds and personally deliver the gifts. Thank you for your help in making the holidays brighter for some very special people. You can also donate to Adopt-A-Grandparent. You can adopt one senior for $20 or you may adopt multiple grandparents. You can also have your children make the holiday card(s) to go along with the gifts as well! Location: Cityteam Community Services Event Center, 1297 North 13th Street, San Jose. Parking is limited so please carpool or use drop off services. Registration is available on the Volunteer Event Calendar. Each child and adult must be signed up individually. No group registrations larger than 5. During the holidays, many local organizations are collecting supplies, food and gifts for families and individuals in need. Consider shopping as a family for some of these needed items, collecting gently-used items from around your home, hosting a fundraiser or donation drive or creating greeting cards to go along with the gifts you provide! We recommend reaching out to the organizations in advance to confirm the dates items are needed by. SHCS distributes 7,400 holiday food boxes to families and toys to 6,200 children. Bring joy this holiday season by dropping off turkeys or new toys! Click here for more information. Donation Station Hours: Monday through Thursday, 8am - 5pm; Friday 8am - 4pm; Saturday 9am - Noon. Closed on National Holiday weekends. Help make the holidays merry for those in need by donating new items! For children ages 0-12: Baby dolls, soft plush toys, building toys, Barbie, board games, ride-on toys, sports equipment, educational/musical toys, gift cards or warm clothing. For seniors: body/personal care bags and blankets. For the homeless: thick warm socks, knit hats, underwear, gloves, cold weather jackets, ponchos and sleeping bags. The city is collecting nonperishable food items as well as new, unwrapped toys to be distributed to needy families this holiday season as part of its annual Food and Toy Drive. Drop off new unwrapped toys through December 16 and donations of non-perishable food through December 21. Toys can be dropped off at City Hall, the Joan Pisani Community Center, Senior Center, and Historical Museum. Food donations can be delivered to the Joan Pisani Community Center, Senior Center, Saratoga Prospect Center, and Saratoga Library. Teen Challenge's mission is to provide successful recovery for men, women, teens, children, and families with destructive, abusive, and addictive lifestyles through mentoring, education, training, and spiritual direction. They are seeking new clothing, new toys, hygiene products, cleaning products and food for the men, women, teens and children in their program. Unity Care uplifts 800 lonely and anxious foster children in our area. They are seeking families or organizations to host holiday parties/drives to collect new unwrapped gifts for children ages 0-24 or $25 gift cards to Target or Walmart. You can also consider adopting or decorating one of 12 teen homes in the Bay Area. CSA is seeking gifts and/or gift cards for teens, food donations and volunteers to help provide holiday spirit to hundreds of families in the local community. SCS is seeking nonperishable food items, new toys, gifts and gift cards for those ages 7-17 for holiday gift distribution to low-income families in Sunnyvale. Food items most needed are healthy cereal, canned tuna, and chicken, peanut butter and jelly, canned soup and canned tomato products. Gift cards to Target and Safeway are also greatly appreciated. Donations are accepted 7am - 8pm from December 1-11. Donations are also being accepted at all Sunnyvale Fire Stations. Hope's Corner is sponsoring our 6th Annual Hope's Corner Children's Christmas Party on December 16. We invite area families in need to come celebrate with us and give parents an opportunity to put something special under the tree for their children. To ensure that we can make a difference for dozens of children in our community, please donate to our annual Christmas Toy Drive through December 15. New, unwrapped gifts for children ages 1-18 and $20-25 gift cards for teenagers will be accepted December 13-15 from 3-5 p.m.
Donation Station: Los Altos United Methodist Church parking lot, 655 Magdalena Ave., and at Trinity United Methodist Church on December 15, 9 - 11 am. Area community groups and organizations are encouraged to organize their own toy drives to benefit the Hope's Corner Christmas Toy Drive. Join us in our efforts to ensure that every child in need in our community receives a new and unwrapped toy this holiday season! The Marines of San Jose, CA are proud to serve all of Santa Clara County by collecting toy donations and in return, giving thousands of new unwrapped toys to Santa Clara County families in need. Visit the San Jose area page for one of the many Toy Drop-Off Locations in your area. Help make the holidays bright for children affected by the North Bay fires and for low-income families. This is a great way to involve your children in the meaning of tzedakah and in helping others during the holiday season. During this busy holiday season sharing kind acts can be a wonderful way for your family to reconnect. Your family can take time to celebrate small acts of kindness with a paper quilt. 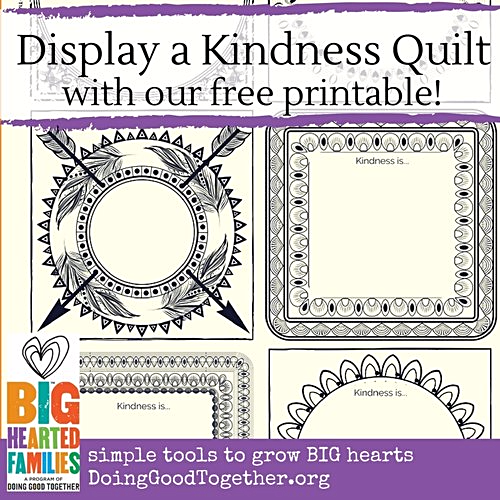 Designed to accompany The Kindness Quilt by Nancy Elizabeth Wallace, this project will have your family doing a kind act, drawing a picture of it, and sharing it with one another in the form of a beautiful, continuously growing paper quilt. Find project templates and more information on the Doing Good Together Display a Kindness Quilt project page. 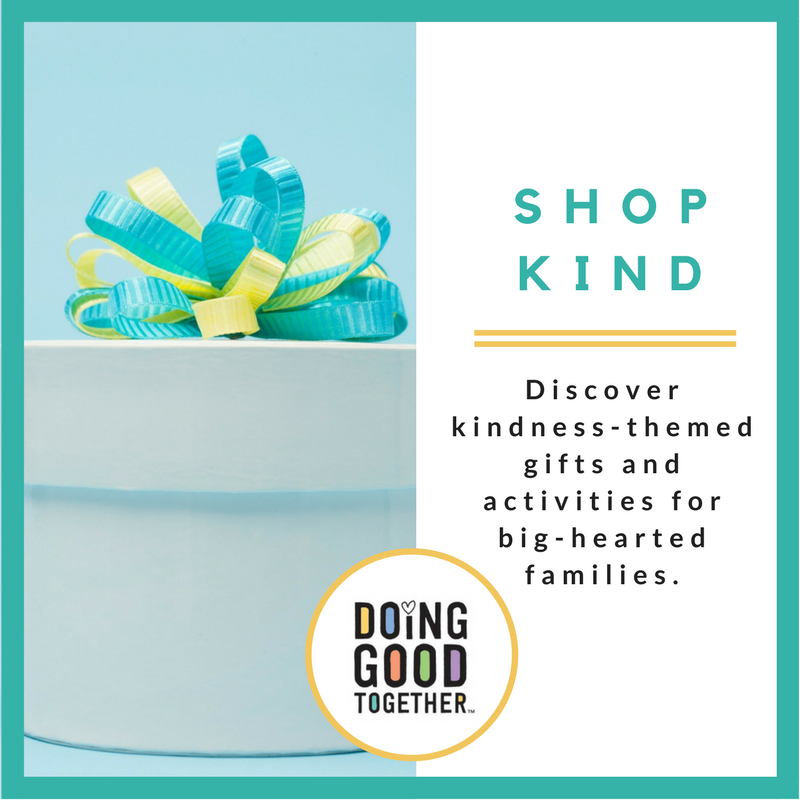 Just in time for Holiday Shopping... DGT™ debuts a SHOP KIND Store! You've relied on DGT for tips, activities, book recommendations, and more. Now we have another resource to offer: our SHOP KIND Store. This online store features a page of kindness-themed Amazon store items (because, yes, DGT is an Amazon Affiliate Advertiser). And we have just launched another SHOP KIND page featuring like-minded organizations offering outstanding, mission-driven products. You can try these unique items for your next service project or when you're shopping for big-hearted gifts for yourself or others. We'll be continually adding more items, so revisit often to find something new. We think you'll like what we've found, and we look forward to your feedback and suggestions for more SHOP KIND products! If you received this email from someone else and would like to subscribe, please click here. When calling to volunteer for any of the opportunities listed above, please let the coordinator know you found it through this listing. You are encouraged to ask any questions you may have of the sponsoring organization before committing to a project. Disclaimer: This list is provided as a service to families. Inclusion of organizations in this listing does not imply affiliation, endorsement or quality assurance on the part of Doing Good Together.™ Doing Good Together™ bears no responsibility whatsoever for the activities and actions of the listed organizations. JW House is a home away from home for families of loved ones receiving treatment at nearby hospitals. We provide warm and comfortable overnight accommodations and day use facilities for families. We are located on the Kaiser Santa Clara Campus and are open 365 days a year. Volunteers will set up for dinner, provide warm food, greet guests and families, clean up/label left over food, refrigerate extra food and lock the House. Volunteers of JW House should mirror its compassion and dedication to helping families of hospitalized patients. If you are a family with children and want to do this evening shift please contact us. Ages: All ages welcome with adult. Families encouraged. Time Commitment: Three hours every other week. Six-month commitment preferred. Contact: Nayna, nayna@jwhouse.org. Driver's License and background check required for adult volunteers in addition to one-time training. JW House is a home away from home for families of loved ones receiving treatment at nearby hospitals. We provide warm and comfortable overnight accommodations and day use facilities for families. We are located on the Kaiser Santa Clara Campus and are open 365 days a year. Dinner is Served one of the most popular volunteer opportunities at JW House. After a long day at the hospital, our guests look forward to coming "home" to find that someone has planned, purchased the ingredients, and prepared a delicious meal just for them. Groups who participate in "Dinner is Served" soon discover that their efforts go far beyond simply supplying a dinner. As families gather for dinner, a warm sense of community exists. It is a place where families can relax with one another and check in on how another's loved one is doing. Thank you for making a difference for these families. Dinners will be needed for both Halloween and Thanksgiving as well if there is a group of families interested in hosting a holiday! Click here to learn more about the Dinner is Served program. Ages: All ages are welcome. Minors need to be supervised by an adult. shows available dates in RED - please click on a red date, then on "Click here to submit your information." Please complete the form to request that date. Someone from our office will contact you soon to confirm the date you request. Date/Time: Friday November 10 and/or Friday November 17. Start times are 6:30pm, 7pm or 7:30pm. Sunday Friends empowers families to break the generational cycle of poverty by fostering positive development in children while educating and guiding parents to support their children's life success. This event is important because the gifts we gather during our shopping spree will make it possible for children and parents to earn, select and gift wrap presents for their loved ones in Sunday Friends' holiday programs. Join us to give the gift of giving this holiday season. We meet at the front of the store, split up into shopping teams and divide up the money collected. We assign each team a "mission" (girls' toys, teens' gifts, dads' gifts, warming presents, etc.). Each team searches the store for the best gifts. We meet back at the registers to check out and award prizes. Each shopper must bring $10 - $100 (or more). Join Project Giving Kids for our first Create the Change Day Bay Area where we will have fun and make a difference all in the same afternoon. Join us to pack hygiene kits for people in need, assemble snack bags for families experiencing medical crises, craft holiday cards for the homebound and so much more. Whether 3, 13, or 30, help us spread messages of hope, and leave with a lot of ideas for how you can Create the Change every day. There will also be music, snacks, raffle prizes and more to keep the excitement going all afternoon! Project Giving Kids wants ALL kids, teens and families who want to make a difference to join us to #CreateTheChange! We have a small number of free tickets available for anyone for whom the ticket price is an issue. Just email us at info@projectgivingkids.org and we'll give you all the details. Ages: All ages are encouraged to attend. Contact: Amy Johnson, Outreach and Marketing Manager, PGK - Bay Area, ajohnson@projectgivingkids.org. Registration is available online. We are people from all walks of life, united in our belief that everyone has the right to live a safe, healthy life, with adequate food and housing, and great schools and jobs. Our voices are loud, our actions are strong, and working together, we are building a stronger community. We are Sacred Heart - join our family! Our Holiday Program begins in November. Together, we'll brighten the season for thousands of families with 7,400-holiday food boxes and 18,600 toys, bikes, and books. Join us in celebrating this tradition by donating or volunteering. Join our family! Make a financial donation to our Holiday program. Give through our Amazon Wish List. Organize a holiday drive at your work, place of worship, school, or service club. Become a fundraiser and encourage your friends, family, and co-workers to join you in supporting Sacred Heart. Volunteer and give your time to the food pantry, clothes closet or another program. Help us on our holiday program, distribute food and Turkeys to our families. Ages: For the onsite Holiday Food Drive program volunteers must be ages 9 or older for Food Packing and ages 15 or older for Food Distribution. Families with children of all ages are welcome to participate in the other volunteer activities. Location: Los Gatos, please contact Krista Lynch to sign up and arrange delivery of items. Imagine having no place to call home. Now, imagine that everything you own goes with you from place to place in nothing but a plastic garbage bag. How would that make you feel? This is what we saw being foster parents to several foster children. No person, let alone a child, should have to feel like that. Join us in purchasing and donating duffel bags of any size to these needy children so they can feel that they matter in the world. Ages: Everyone is welcome to participate. Come to the Helleyer Park Weeding Party to clean up your park while meeting new people. We have all the tools, we just need you. These events are a great way to meet new people and put some sweat equity back into your park. And, you get some time outdoors, which is good for your health! We'll be working in three zones: Velodrome, Dog Park, and east side of Cottonwood Lake. No special skills are required. Please wear long pants, a long sleeve shirt, and bring a water bottle and sunscreen. Work gloves and necessary tools are provided. Refreshments will be available following the event. Sponsors are Santa Clara County Parks and Keep Coyote Creek Beautiful. Ages: All ages welcome. Volunteers ages 15 and under must be accompanied by a parent or guardian throughout the event. Volunteers age 16-17 may participate without parent/guardian supervision but only if they present a completed volunteer application including a parent or guardian's signature. Application forms are available at the event, but the parent or guardian must be present to sign. Contact: Deb Kramer, deb@keepcoyotecreekbeautiful.org, 408.372.7053. To register, RSVP at https://17fall-kpweeding.eventbrite.com and choose the date from the drop-down menu. Date/Time: Varies. The normal volunteer schedule is Monday through Thursday, with most shifts during daytime hours. Evening and weekend shifts are scheduled occasionally. Location: Varies depending on delivery area and/or volunteer assignment. Random Acts of Flowers recycles flowers from the floral industry, as well as local companies, florists, grocery stores, funeral homes, and events like weddings. We turn these flowers into beautiful bouquets and deliver them to those struggling with injury, illness and the aging process every week in neighborhoods all over the country. Random Acts of Flowers improves the emotional health and wellbeing of individuals in health care facilities by delivering recycled flowers, encouragement, and personal moments of kindness. Volunteering at Random Acts of Flowers helps us spread joy and allows people to nurture a culture of compassion and care. Volunteers range in age from elementary students to retirees. Individuals and groups - including schools, church groups, civic groups, businesses and even sports teams - make up the more than 2,000 people who share their time and talent to bring flowers and moments of joy to those in area hospitals, hospices, and health care facilities. Ages: Ages seven and up with adult present. Most volunteer opportunities are best suited for children 12 and older but younger children can attend with an adult. An adult must accompany all children under 16. Every child must have a signed Youth Waiver before volunteering. We ask that anyone interested in volunteering attend an orientation. During orientation, new volunteers will meet our team, learn about volunteer opportunities, and have hands-on training working with the flowers. Project Linus provides homemade blankets to children in need. Our blankets are lovingly made by adults and children from all walks of life and many different sources. Volunteer blanket makers help provide love, a sense of security, warmth and comfort to children who are seriously ill, traumatized, or otherwise in need through the gifts of new, handmade blankets and afghans. You and your family can make easy, warm, cozy, no sew blankets to donate to children in need. Click here for blanket making instructions. Though most 'blanketeers' choose to work on their own, some organizations have hosted their own "Make A Blanket Day"' for their group. It can be a fun team-building event and Project Linus can help you with planning and preparation. Contact: Sharon Lee, sjlinus@comcast.net, 408.252.1858 or Barbara Ross, sjlinus@gmail.com, 408.295.2287. Please respect our family time, as we do our Project Linus volunteering between 9am and 5pm, Monday thru Friday. We will reply to your emails and phone calls during those days & times. Location: A homeless shelter or soup kitchen in your community. Many homeless shelters and soup kitchens rely on volunteers to provide meals for their guests. You and your family can help by providing a meal or meals. To find a local shelter or soup kitchen, Google homeless shelters along with your city name. Once you find a shelter, contact their volunteer coordinator to see if they are looking for volunteers and check for any age requirements. The shelter will help you schedule a date and provide you with any specific instructions. 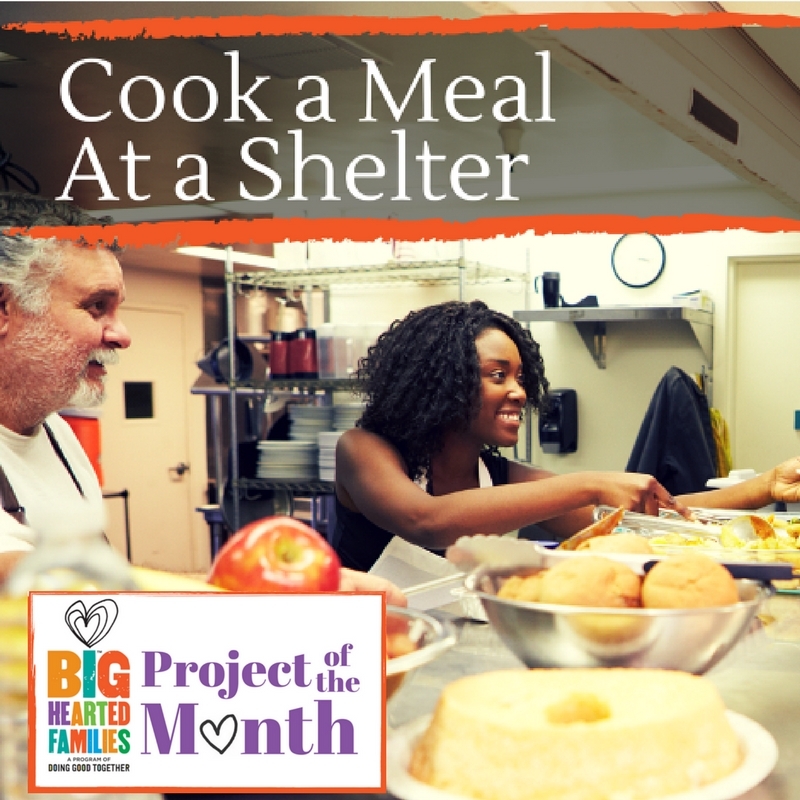 Find more information and ideas on the Doing Good Together Cook a Meal at a Shelter Project page. In this month of gratitude and giving, Minnesota holds its traditional "Give to the Max Day" on November 16th, and the global effort "Giving Tuesday" donation day takes place this year on November 28th. Kindly consider a gift to DGT to help us grow more kindness among more big-hearted families. We appreciate your support! Bay Day is an official holiday dedicated to connecting Bay Area communities with the beautiful and unique ecological wonders of San Francisco Bay. Ignite your love for the Bay and protect this natural, local resource by volunteering in our Native Plant Nursery, where we raise thousands of seedlings for restoration projects each year. Join us in celebration of the 2nd annual Bay Day! No experience necessary. Gloves, tools and instruction provided. Save The Bay staff certified in first aid and CPR lead each event. Ages: For all restoration events, a parent or guardian must accompany children under the age of 16. Contact: Rachelle Cardona, rcardona@savesfbay.org, 510.463.6850. Due to the sensitive nature of the restoration site, space is limited and RSVP is requested. You must register online in order to sign up yourself or a group of ten people or less. Date/Time: Saturday October 7, shifts are available between 7am and 6pm. Volunteers are especially needed in the afternoon and evening. Volunteers are needed to support the Third Annual Harvest Festival at Martial Cottle Park. The event will include farm tours, pumpkin painting and carnival activities, historical ranch activities, food vendors, live music, a corn maze, fresh produce for sale, square dancing, face painting, and much more! There are many special event volunteer positions to choose from including set up, tear down, activity stations and more. All volunteers should bring a water bottle, sunscreen and hat. Snacks for volunteers will be available, but please bring a lunch or money to purchase lunch from the food vendors. Ages: Volunteers under 18 must have a parent or legal guardian sign a volunteer waiver before they can participate. Time Commitment: Varies depending on position. Join the fight to end Alzheimer's. Each year we bring the Walk to End Alzheimer's to over 600 communities in the U.S., and we could not do it without our dedicated volunteers. You and your family can help raise awareness and bring your passion for the cause on Walk Day. Volunteers are needed for event set up, registration, ushering, the Family Pavilion, Remembrance Area, parking, break down and more! Ages: All ages are welcome to volunteer for most positions, with adult supervision. Time Commitment: Three to five hour shifts available depending on volunteer position. Contact: Tessie Calligeros, tcalligeros@alz.org, 408.372.9900, Registration is available online. Date/Time: Friday and Saturday, October 13 and 14. Exact times vary depending on shift. There are five shifts; one Friday and four on the day of the event, Saturday, October 14. We especially need help with set up and tear down! Pumpkins in the Park is a harvest fair for families with a strong environmental education component. It is designed to promote awareness of the Guadalupe River Park and celebrate the fall season. Through this festival, Guadalupe River Park Conservancy highlights a portion of our 3-mile park and gardens by bringing families into the park for a day of learning and fun. Volunteers are needed to help make Pumpkins in the Park successful! Ages: All ages are welcome to volunteer. Volunteers younger than age 15 must have an adult present. Contact: Ricky Davis, Volunteer Coordinator, ricky@grpg.org, 408.298.7657 x16. Registration is available online. Date/Time: Flexible - choose a time that works for you. Location: You choose! Simply find a local business, school, place of worship, community center or neighborhood that will allow you to hold your bake sale. It's that simple. We have more ideas for good locations in our Location Guide. Funds raised through Bake Sale for No Kid Hungry support Share Our Strength's No Kid Hungry campaign to end childhood hunger in America. Nationally, the campaign provides leadership, raises awareness and advocates for change that will make sure no kid in America ever goes hungry. Locally, Share Our Strength funds the most effective anti-hunger organizations and builds partnerships that bring together public officials, nonprofits, community groups, private funders and businesses to end childhood hunger in a particular state or city. Click here for more information on how to start your own Bake Sale. Our online Bakers' Resources includes lots of how-to tips, signage and much more. If you are looking for something that is not on the list, please call or email us with your suggestions. Peninsula Volunteers provides programs, support and guidance for seniors in our community as they pursue the pathway of a long and useful life. Every week, Peninsula Volunteers delivers over 2,500 hot, nutritious meals to primarily homebound seniors and adults with disabilities in San Mateo County who are unable to cook and shop for themselves. Weekday Meals on Wheels meal packers are needed at least once a month. We serve 600 meals per day! Hours are available both in the morning and afternoon on weekdays only. This is a great opportunity for parents or grandparents to bring their children. Ages: An adult must accompany volunteers ages 7 - 16. Contact: Victoria Cormack, Community Volunteer Manager, vcormack@penvol.org, 650.272.5108. Please contact Victoria to sign up. CureSearch raises funds for children's cancer research to ensure that more children have access to life-saving treatments today and into the future. Ultimate Hike: Create Your Adventure is your chance to plan your lifesaving adventure from start to finish. You pick the trail, the distance, the date, and you set your own fundraising goals. All you need is a trail and your own two feet, and every step you take will make a difference! From the main Create Your Adventure page, click Register in the navigation bar at the top of the page and choose whether you want to register "As an individual," "As a Team Captain" (to start a new team), or "As a Team Member" (if the team already exists). You will then have the chance to start a new adventure! Join Save The Bay at Eden Landing to tend to native seedlings and remove harmful invasive species. Once established and thriving, these native seedlings will provide habitat for wildlife, protect our communities from flooding, and improve water quality for all Bay inhabitants. No experience necessary. Gloves, tools and instruction provided. Save The Bay staff certified in first aid and CPR lead each event. Mentor + Mentee Matching: Volunteer families can be matched with newly-arrived individuals and families to help answer any questions relating to American culture, customs, processes, laws, or community resources that would help their match feel more connected; help find solutions to needs such as finding a job, preparing for college, filing for FAFSA, fixing a car, or passing a driver's test; and provide opportunities to get out, explore surroundings, make new friends, learn a new skill or hobby, and connect to others within their communities. Community Acculturation Events: Community managers, mentors, and mentees plan engaging quarterly events. Events can be sponsored by corporations or partner NPOs. Some upcoming events include career panels sponsored by Google, family dinners, beach and sightseeing outings, a night at a Giants Game. We are working to plan acculturation events in cities throughout the U.S. but need volunteers and funding from within those cities! Ages: All ages. Children 18 and younger must be accompanied by a parent or legal guardian. Location: A homeless shelter your community. Many homeless shelters really appreciate having a supply of sandwiches on hand to give to their residents for lunch. 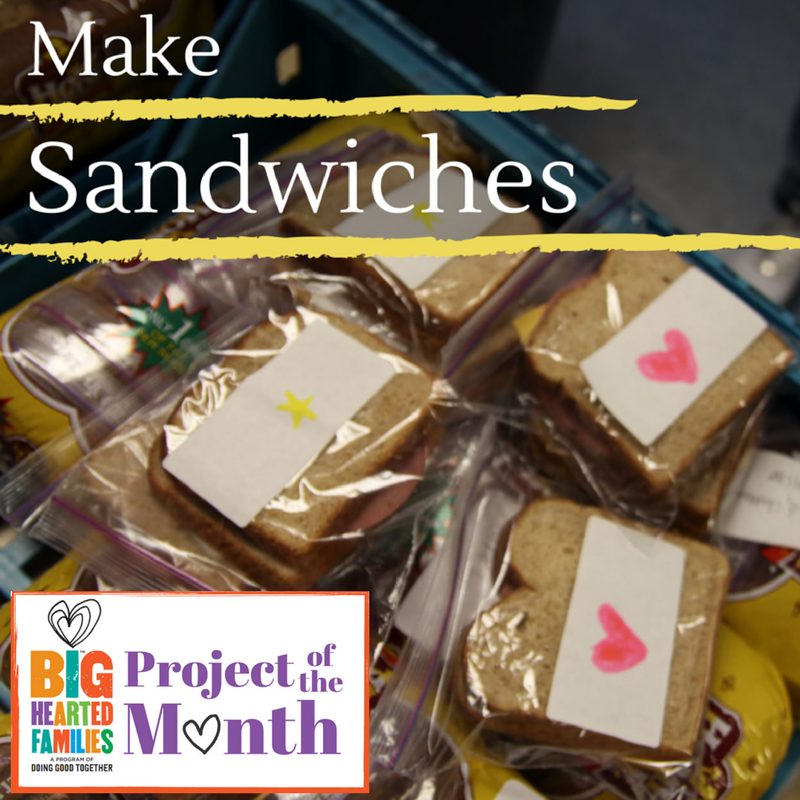 You and your family can help by making sandwiches to bring to a local homeless shelter in your community. First, find a local shelter interested in your donation, check on any specific instructions, and arrange a delivery date and time. Then gather your supplies, make your sandwiches, and deliver them as a family. 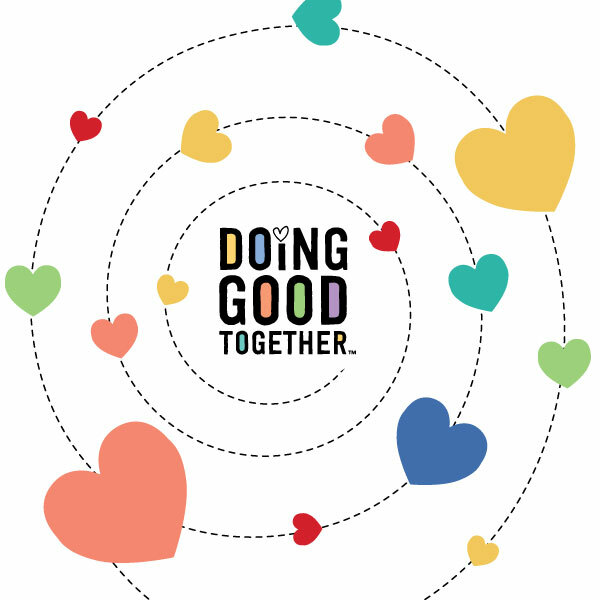 Find more information and ideas on the Doing Good Together Make Sandwiches Project page. As you know, Doing Good Together promotes lessons in kindness and empathy through big-hearted conversations which often take place during storytime. Reading DGT's recommended books on topics such as kindness, gratitude, and mindfulness leads to great discussions. Likewise, DGT offers book lists on challenging issues, like bullying, hunger, and global poverty. 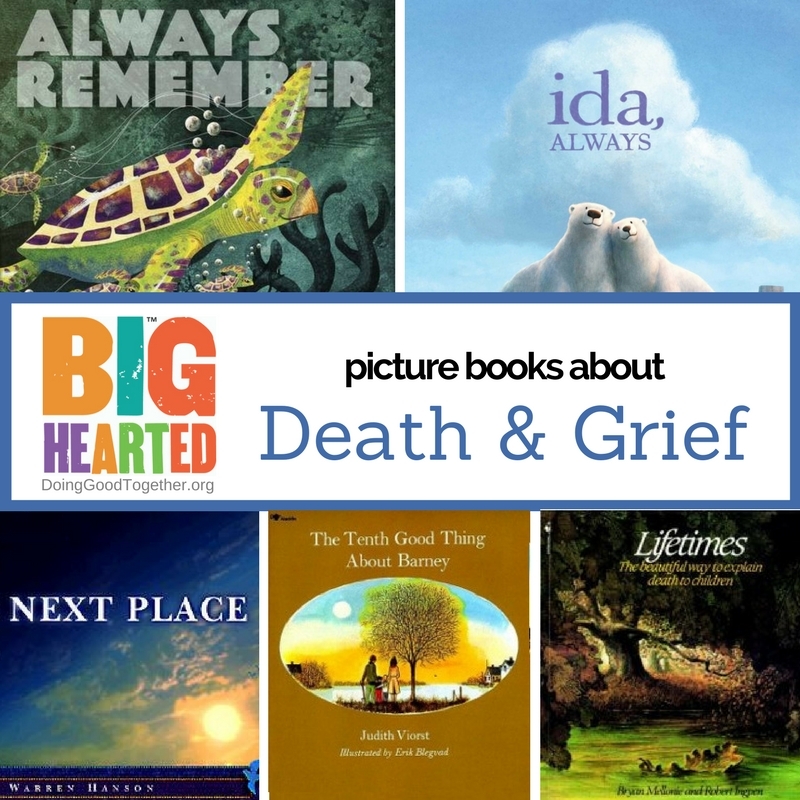 Our newest book list focuses on the important subject of Death & Grief. We hope these books help you and your young ones start age appropriate conversations on a tough topic that deserves discussion. Help make a senior's holiday season extra special and sweet by decorating a bag for them to stuff with goodies. This program is supported in part by a grant from the Jewish Community Federation and Endowment Fund. Volunteers of all faiths, beliefs and backgrounds welcome. Ages: Families with children preschool and up are welcome to volunteer. Ages: Children of all ages are welcome to participate with adult present. Contact: Robin Vasilakos, rvasilakos@paloaltojcc.org, 650.223.8791. This is a FREE event, prior online registration is required. Superheroes are taking over the Bay Area! Proceeds raised from this event will be utilized to provide support, education, research and to create awareness for Congenital Heart Defects, the most common birth defect worldwide. Families in California will benefit directly through the programs and services provided by Mended Little Hearts and Heart Heroes, Inc.
Ages: Volunteers of all ages are welcome with adult supervision. Time Commitment: Shifts vary based on task. Contact: Jeremy Merckling, Jeremy@grassrootsecology.org, 650.419.9880. Registration is available online. Let's work together for a vibrant Coyote Creek! Coastal Cleanup Day is a terrific way to show your support for your California waterways, not just the Coast. Spend a few hours at Coyote Creek and help beautify our creek through a community cleanup. Be sure to wear long pants, long sleeves, and closed-toed shoes since you will be near poison oak and around loose or muddy soil. This event is co-sponsored by Keep Coyote Creek Beautiful and the Senter Monterey Neighborhood Association. Ages: All are welcome to participate (those under 13 must be accompanied by an adult). Volunteers under age 18 must have a signed waiver (available upon completed registration). Community service hours are available. Contact: Deb Kramer, deb@keepcoyotecreekbeautiful.org, 408.372.7053. Registration is available online. Date/Time: Sunday, September 17, 9am - 1pm. Please arrive on time as we will leave McClellan Ranch when we finish introductions around 9:15 and carpool to the other sites on Stevens Creek. Do you have science minded kids or budding environmentalists in your family? Then this volunteer opportunity is a great fit for you! Starting from McClellan Ranch we will visit eight sites on Stevens Creek to gather data on pH, temperature, dissolved oxygen, specific conductance and turbidity. Volunteers are responsible for arranging their own transportation. We generally finish with the upper watershed by about 11am and the lower watershed by 1pm. No experience is needed; we will train you. Come enjoy and learn about these beautiful creeks while you collect data to protect their health. Please bring a reusable water bottle. You will not be getting into the creek, but it is best to wear comfy shoes and dress appropriately for the weather. Ages: Volunteers of all ages are welcome; minors under 18 require a parent to approve the online waiver when you register for this event, and children under 12 require an accompanying adult. Contact: Jeremy Merckling, Jeremy@grassrootsecology.org, 650.419.9880. Registration is available online. Please contact Jeremy for more information or to register groups larger than four. Prepare a meal for an individual or family who are unable to prepare their own meals. Jewish Family and Children's Services (JFCS) has partnered with the OFJCC to make it possible to help support these people. This project will be done in two stages. First, we will prepare individual meals in our community kitchen, pack them and then deliver them to the designated people. This is a great opportunity for families to do a project together as well as take it personally to someone in need. Volunteers of all faiths, beliefs and backgrounds welcome. Ages: Children ages eight and older are welcome to participate with adult present. Contact: Robin Vasilakos, rvasilakos@paloaltojcc.org, 650.223.8791. This is a FREE event, prior online registration required. Volunteers are needed to help with all of the logistics of the Canary Challenge Event. The event is a cycling/5K walk and run event that benefits the Canary Foundation - a nonprofit focused on the early detection of cancer. On the day of the event, volunteers will be working closely with the Canary Challenge staff to help with the lunch, merchant, registration, volunteer and information booth set up at our Village (start/finish point for cyclists). There are also six rest stops along the various routes for the cyclists, and volunteers are needed to help with snacks/drinks for the resting cyclists at each rest stop. This is a very fun filled event! Volunteers will receive volunteer t-shirts and a complimentary lunch at one of our three gourmet food trucks in the Village. Time Commitment: Varies depending on volunteer role. The purpose of SVBC is to create a healthy community, environment, and economy through bicycling for people who live, work, or play in San Mateo and Santa Clara Counties. Valet bike parking is one of many ways that Silicon Valley Bicycle Coalition encourages people to bike to public events. Volunteer responsibilities include accepting event attendees' bikes, placing them on bike racks, keeping a watchful eye during the event and then happily returning them to the attendees when they are ready to leave. Perks (such as snacks, free entry, or a meal) are usually provided for volunteers, depending on the event. Volunteer to park bikes at the 49ers v. Carolina Panthers game on September 10 at Levi's Stadium. Find out more or sign up here! Volunteer to park bikes at the 49ers v. LA Rams game on September 21 at Levi's Stadium. Find out more or sign up here! Volunteer to park bikes at Canary Challenge on September 30 in Palo Alto. Find out more or sign up here! Ages: Children ages eight and older can volunteer with an adult guardian and signed waiver; those ages 14 and older can volunteer with a signed waiver. Meal Serving Programs: Volunteers are needed to help with meal preparation, set-up of the dining hall, dishwashing, serving food and drinks, and clean up. Wear comfortable "work" clothes and closed-toed shoes (i.e., jeans, walking shorts, tennis shoes, etc.) Please do not wear sandals, halter or tank tops, short shorts, etc. For those with longer hair, please wear your hair up and off your face. Goodwill Community Garden: The garden provides fresh vegetables for our dinner service program. Support is needed with weeding, planting and harvesting the vegetables, depending on the time of the year. Please wear comfortable clothes, bring water and sunscreen. Gloves are optional. The Garden is located at the far rear right corner of the parking lot, please proceed through the parking lot and park in the back. Ages: Families with children of all ages are welcome to help with the meal serving programs. An adult must accompany children 14 and younger. Community Garden volunteers must be 15 or older. Time Commitment: Two to three hours depending on program. Contact: Hyru Gau, 408.922.9285 or 408.922.9085 x104 or volunteer@loavesfishes.org. Registration is available online. Please bring a completed Volunteer Agreement form to your volunteer shift. Cityteam San Jose Community Services helps meet the critical needs of community members living below the poverty line by providing them with the resources they need to overcome the hardships they are facing and to break out of the cycle of poverty. Cityteam receives donations of food, clothing, household items, diapers, hygiene products, and furniture that are then distributed to families in need. Volunteers may help with tasks such as sorting donations, packing food boxes, maintaining the gallery (free store), organizing the warehouse, cleaning, distributing food bags, and/or assisting clients. Volunteers should be prepared to work hard as you make a meaningful impact in your community! Fresh Market Distribution volunteers are needed to hand out fresh produce to individuals and families. Ages: Volunteers ages 12 and 13 can volunteer with a parent. Older teens can volunteer on their own. Contact: Erin Campos, Ecampos@cityteam.org, 408.232.5620. Registration is available on the Cityteam Volunteer Projects Calendar. The above volunteer opportunities are listed under "Community Services" on the Projects Calendar. Registering a minor is the same as registering an adult. To register a minor, you will need to create an account for them in addition and agree to the volunteer terms on their behalf. We are what we do. By adopting one or two simple, caring routines, you'll give your children a strong sense of themselves as helpers. 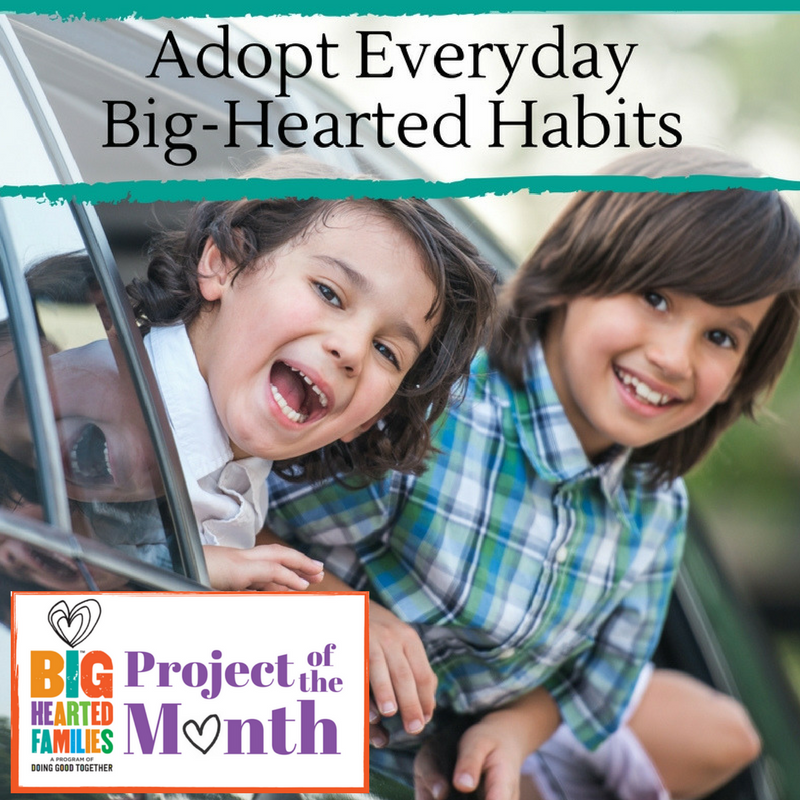 In this way, big-hearted habits empower kids to become thoughtful, engaged citizens throughout their lives. 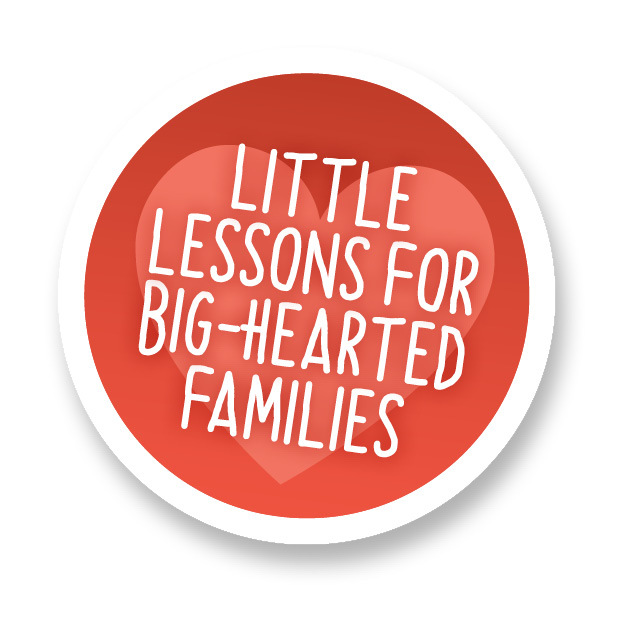 Visit the Big-Hearted Families Adopt Everyday Big-Hearted Habits page for ideas to add kindness to your everyday family routines. Ages: There are ideas for families with children of all ages. 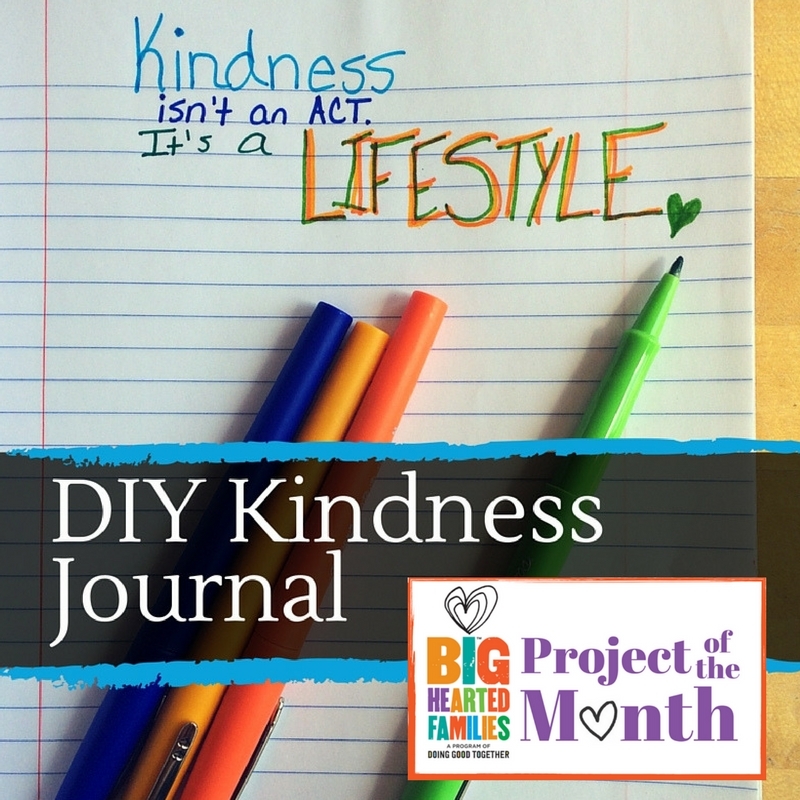 Take DGT's 30-Day Back-To-School Kindness Challenge! Big-hearted families may be familiar with our popular 30-Day Kindness Challenge and our Summer of Kindness Bucket List. Now with the fall season upon us, we're offering children and tweens/teens their own "30-Day Back-To-School Kindness Challenge"! These unique ideas help students focus on daily acts of kindness before, during, and after the school day. Let's make the 2017-18 school year the kindest one ever! Print and post yours today. Choose from the elementary grade and/or upper grade challenge. Come to the Helleyer Park Weeding Party to clean up your park while meeting new people. We have all the tools; we just need you. These events are a great way to meet new people and put some sweat equity back into your park. And you get some time outdoors, which is good for your health! We'll be working in three zones: Velodrome, Dog Park, and east side of Cottonwood Lake. No special skills are required. Please wear long pants, a long sleeve shirt, and bring a water bottle and sunscreen. Work gloves and necessary tools are provided. Refreshments will be available following the event. This event is sponsored by Santa Clara County Parks and Keep Coyote Creek Beautiful. Ages: All ages are welcome. Volunteers ages 15 and under must be accompanied by a parent or guardian throughout the event. Volunteers age 16-17 may participate without parent/guardian supervision but only if they present a completed volunteer application, including a parent or guardian's signature. Application forms are available at the event, but the parent or guardian must be present to sign. There With Care provides a wide range of thoughtful and fundamental services to children and families during the critical phases of a medical crisis. They serve families referred by medical agencies by building a network of services and people who ease the burden of life's day-to-day obligations with compassion and care. You can help care for the families of critically ill children in your community by delivering groceries and other needed items to them. Volunteers must attend a one-time mandatory 90-minute training before heading out with grocery and supply deliveries from our pantry in Menlo Park to families on the Peninsula, Lucile Packard Children's Hospital, and Ronald McDonald House. Please bring your children of all ages to help you volunteer! Ages: Primary volunteer must be at least 18 years old with a drivers license, background check and orientation for drivers meeting with families, but please bring your children! Time Commitment: Flexible, orientation required. Register for orientation online. Location: Multiple locations in Palo Alto, Cupertino and Los Altos including Foothills Park, Pearson-Arastadero Preserve, Redwood Grove Nature Preserve, McClellan Ranch and San Franscisquito Creek. Grassroots Ecology leverages the power of community volunteers to create healthy ecosystems across Silicon Valley, from the foothills to San Francisco Bay. We restore native plants to open spaces and neighborhoods, steward creeks and watersheds, and provide nature education in the classroom and in the field. Monthly volunteer projects involve planting native plants, removing invasive plants and sheet mulching. This is a also a great opportunity to do a bit of wildlife watching and learn about our local native habitat. Please bring a reusable water bottle and dress for outdoor work (sturdy shoes and long pants recommended). We provide gloves and tools. Contact: Each event has a different supervisor. Please contact the supervisor listed on the event page. Registration is available online. If you cannot attend, please notify the Grassroots Coordinator listed on the event page so that your place will be available for another volunteer. If you have additional questions about Grassroots Ecology you can contact Jeremy Merckling, Jeremy@grassrootsecology.org, 650.419.9880. Family volunteer opportunities at local Relay for Life events can include, but are not limited to: Luminaria set up, trash pick up, track signs & general signage, set up/tear down, registration, and staffing the Fight Back Tent. Families are also welcome and encouraged to sign up to participate in the Relay For Life. If you are interested in walking as a family or with a team, check out your local Relay For Life event sign up page. Time Commitment: Varies depending on event, but Relay For Life is flexible for you! Cityteam San Jose invites you to volunteer for our Backpack Distribution Festival to be held on Saturday, August 12th for local children in need. We need hardworking and compassionate volunteers who strongly believe that education is a great step towards a brighter future. We anticipate distributing 500 backpacks at this event. Volunteers are invited to help with game booths, food distribution, set up, break down, prize store, cleaning, and security. Ages: Volunteers must be at least nine years old. An adult must accompany children under 14. Contact: Erin Campos, ecampos@cityteam.org, 408.232.5620. Please register for this event on the Cityteam Volunteer Projects Calendar. Registering a minor is the same as registering an adult. To register a minor, you will need to create an account for them in addition and agree to the volunteer terms on their behalf. Date/Time: Sundays between 10:30am and 5:30pm. Also, there are some after-school shifts on weekdays at our special store. Volunteers are needed to work directly with children, and maybe also their parents, to facilitate service and learning projects, including: craft gift making, healthy food preparation, letter and essay writing, hands-on science projects, math and other learning games, computer education, English as a Second Language classes, reading and book report writing, exercise class, parents' classes and more. Because children and parents earn tickets for their participation, redeemable for basic necessities in our special stores, you might also assist with the banking, store setup or shopping. Ages: Families, teens, adults, and groups are all welcome. An adult must accompany children under age 14. Time Commitment: No predetermined number of hours, but if you sign up to come to a program, you are expected to come. Come join the Veggielution team for weekly Youth Garden Activities. Every Saturday your whole family can enjoy gardening, crafting, and learning together in the Youth Garden. Participating in our Youth Garden activities is a great way to spend time with your children while exploring the garden, learning about the exciting processes of the natural world - not to mention making new friends. This is a unique opportunity to get your hands dirty and become better stewards of the environment as a family. Veggielution volunteer activities encourage exploration and play-based learning for the whole family. Ages: Families with children ages three and up are welcome to volunteer. Families visiting the Youth Garden should have a 2:1 child to adult ratio for ages 3-6, and a 3:1 ratio for ages 7 and up. Contact: Emily Martinez, emilym@veggielution.org, 408.753.6705. Registration is available online. Come join us at our Community Nursery! The nursery will happily accept volunteers for all of August. Tasks will vary depending on project demands, but there is always plenty to do. Volunteers must wear pants and closed toed shoes that are sturdy. They must also bring a reusable water bottle and a hat or sunblock. Ages: All ages are welcome, children under 12 must have a Parent or Guardian present. All minors must provide a parental consent form. Contact: nurseryvolunteers@ourcityforest.org, 408.998.7337 x119 (the best way to contact Our City Forest is via email or to visit the nursery) To sign up to volunteer please email nurseryvolunteers@ourcityforest.org. Volunteers are essential to Tri-City Volunteers food bank's daily grocery cart preparation and distribution. We need approximately 40 warehouse volunteers a day to ensure that as many as 350 client families per day receive adequate nutrition. Volunteers also help us sort and hang donated clothing and attractively merchandise our boutique thrift store, which provides very low-cost items of struggling families: babies clothes are 10 for $1.00, children's clothes are 5 for $1.00 and the majority of adult clothing is marked at $0.50 or $2.00. Community volunteers are the heart of our agency. Not only do volunteers work directly with low and very-low income families, they bring to life our vision of a community united together to ensure that every child and adult in our area is not just free from hunger, but can access pathways to financial stability and self-sufficiency. While volunteers assist families in Tri-City Volunteers food bank and thrift store, they are also mentoring and deeply connecting with others. That is the real strength of our work. Ages: Families with children ten and older are welcome to volunteer. Contact: To learn more and to sign up for volunteer orientation, contact Gloria Lara, glara@tri-cityvolunteers.org, 510.793.4583. Location: 2 Marshlands Road, Fremont. Meet in the parking lot at the Visitor Center. Driving an additional 2.5 miles may be required since the project may be at a different location. If you are interested in improving the refuge for visitors and for wildlife alike, join us at the Visitor Center for a community service project. We will do either a trash cleanup or a planting/weeding project. Dress appropriately for the task and for the weather. We will have gloves to lend and will provide the tools. Please bring your own water bottle. Ages: All ages are welcome; an adult must accompany children under the age of 16. Contact: Paul Mueller, Paul_Mueller@fws.gov, 510.792.0222 ext. 361. Sunnyvale Community Services works to prevent homelessness and hunger by providing emergency services to our neighbors in need. Exposing children to the concept of giving back is very important to many families and to SCS. We encourage and appreciate the following family activities, which are very helpful to SCS and can stimulate great conversation and discovery for you and your children. See our wish list page for specific donation needs. Feel free to bring your children with you when you donate items to SCS. Monthly family shopping trips to purchase items specifically for donation to SCS. Establish a relationship with a local retailer to pick up damaged food, cleaning products, toilet paper, or other staple household items on a regular basis. Collect hotel/motel toiletries while traveling or on vacation. We distribute hygiene kits of toothpaste, shampoo, soaps, lotions, and disposable razors to low-income and homeless clients. Buy new books for low-income children. Feel free to wrap them and include a personal note (first names only please). Buy new socks and or gloves for the homeless. Feel free to wrap them and include a personal note (first names only please). Purchase and assemble plastic utensil packets - 2 forks, 2 knives, 2 spoons, and 2 paper napkins, all sealed together in a sandwich size plastic ziploc bag. Make scarves in the wintertime by cutting a yard or two of fleece into 6 inch wide strips, then cut fringe at the ends. Arrange with us to pick up a bale or two of brown bags to be doubled at home - we use 7000 double bags every month so need a constant supply! For years, DGT™ founder Jenny Friedman, PhD, has offered insight, research, and tips on a variety of trending topics in each of her monthly newsletters. These popular offerings are now made better by a new & improved Newsletter archive page on our website which compiles these resources in easy-to-find layout and in more shareable web-based format. Search by category (such as preschoolers vs. tween) or tags, which signify topics such as empathy, nature, or play. Read, share, and of course, subscribe to these offerings today! Peninsula Volunteers provides programs, support and guidance for seniors in our community as they pursue the pathway of a long and useful life. Every week, Peninsula Volunteers delivers over 2,500 hot, nutritious meals to primarily homebound seniors and adults with disabilities in San Mateo County who are unable to cook and shop for themselves. Weekday Meals on Wheels meal packers are needed at least once a month. We serve 600 meals per day! Hours are available both in the morning and afternoon on weekdays only. Ages: An adult must accompany volunteers age 7 - 16.
asylees, and immigrants while building tolerance and understanding throughout their new communities. Our core work focuses on mentor matching, community acculturation events, and providing extracurricular opportunities. Help newly arrived people feel "At Home" in their new communities. Provide U.S. citizens with opportunities to serve "At Home." Guide newly arrived persons through becoming self-sufficient and preparing for prosperous college educations and careers. Foster friendships, learning, tolerance, understanding, and healing among all participants. Community Acculturation Events: Community managers, mentors, and mentees plan engaging quarterly events. Events can be sponsored by corporations or partner NPOs. Some upcoming events include career panels sponsored by Google, family dinners, beach and sightseeing outings, and a night at a Giants Game. Ages: All ages are welcome to volunteer. Children 18 and younger must be accompanied by a parent or legal guardian. Celebrate the 4th of July (on the 3rd) with the lovely residents of Lytton Gardens! Volunteers will help set-up for the BBQ and facilitate some events and games. Lytton Gardens is a "multi-level" retirement community that provides a home for low-income seniors who are able to maintain their independence. As an integral part of the Lytton Gardens community, volunteers help create an environment of independence and personal fulfillment for our residents. Both residents and volunteers experience the camaraderie and personal satisfaction of new relationships and deep friendships. Los Gatos Creek Bascom Ave: Parking is just north of the restaurant and business complex at 1475 S. Bascom Avenue. Please park on the north end of the lot and take bike trail access down to the creek trail and sign-up table. Los Gatos Creek Auzerais Ave: Parking is on the street. The cross streets are Wright Place and Auzerais Avenue where our sign-up table will be adjacent to the entrance of the bike trail next to Los Gatos Creek. Volunteers will participate in a creek and trail clean up. Please bring your own water container, which we will fill for you. SBCCC supplies gloves, pick-up stick and miscellaneous tools. Please wear long pants, hat, sunscreen, and be ready to spend the morning doing light to moderate work. We have work for all ages and physical ability levels. Ages: Elementary school age and up, volunteers under age 16 MUST have an adult present. Swim for MS encourages volunteers to create their own swim challenge while recruiting online donations to support the Multiple Sclerosis Association of America (MSAA). There are no specific locations, date, or time - you can swim at any pool, any time! You can participate individually or recruit a team. Prizes are given to the top fundraiser each month. Through the participation of Swim for MS, you will help spread awareness of multiple sclerosis and promote the positive benefits of swimming for people of all ages and skill levels. Set your challenge and personalize your webpage. Contact: swim@mymsaa.org, 800.532.7667. Please visit SwimForMS.org to register. Keep Coyote Creek Beautiful and the City of San Jose's Kelley Park invite you to spend a few hours at Coyote Creek and help beautify it with a community clean up. Coyote Creek alongside Kelley Park flooded back in February. Now, we have the opportunity to get down and dirty to cleanup the creek. Improve your 'Trash Karma' by participating! Volunteers are needed to help with registration and photos as well as participate in the clean up. Be sure to wear long pants, sleeves, and closed-toed shoes since you will be near poison oak and around loose or muddy soil. Ages: All ages are welcome to volunteer; an adult must accompany those under 13. Volunteers under 18 must have a signed waiver to participate (available upon completed registration). Contact: Deb Kramer, deb@keepcoyotecreekbeautiful.org, 408.372.7053. This event sponsored by Keep Coyote Creek Beautiful, Happy Hollow Park and Zoo, City of San Jose Parks, Recreation, and Neighborhood Services. RSVP at www.KCCB.Eventbrite.com. Volunteer to park bikes at San Jose Obon Festival on July 8-9 in Japantown, San Jose. Find out more or sign up here. Volunteer to park bikes at Music in the Park on July 20 in Plaza de Cesar Chavez, San Jose. Find out more or sign up here. Volunteer to park bikes at the soccer game on July 23 at Levi's Stadium. Find out more or sign up here. Volunteer to park bikes at the soccer game on July 26 at Levi's Stadium. Find out more or sign up here. The purpose of the Silicon Valley Bicycle Coalition is to create a healthy community, environment, and economy through bicycling for people who live, work, or play in San Mateo and Santa Clara Counties. Valet bike parking is one of many ways that Silicon Valley Bicycle Coalition encourages people to bike to public events. Volunteer responsibilities include accepting event attendees bikes, placing them on bike racks, keeping a watchful eye during the event and then happily returning them to the attendees when they are ready to leave. Ages: Children ages eight and older can volunteer with an adult guardian; those ages 14 and older can volunteer on their own. The needs of people struggling with poverty, homelessness, and addiction are complex, but Cityteam San Jose is passionate about helping individuals and families in our community. Cityteam programs offer a variety of resources to meet needs and to provide real help and hope. Run 4 Recovery is a family-friendly event to benefit our Men's Recovery and Homeless Programs. We are seeking volunteers to help run this event smoothly. Volunteers will help set-up tables, canopies, games, chairs, cheer on incoming runners, and hand water to runners. Ages: Volunteers ages nine and up are welcome with an adult present. Contact: Erin Campos, Ecampos@cityteam.org, 408.232.5620. Email Erin to sign up or to learn more. Groups are also welcome to volunteer. Make science your next family service project! A citizen scientist is a curious person wiling to volunteer time, effort, and resources to further scientific endeavors, often - though not always - in collaboration with researchers. Choose one among hundreds of research projects searchable through SciStarter.com. Some are online only. Others get you out into nature. Still others put you to work analyzing results. 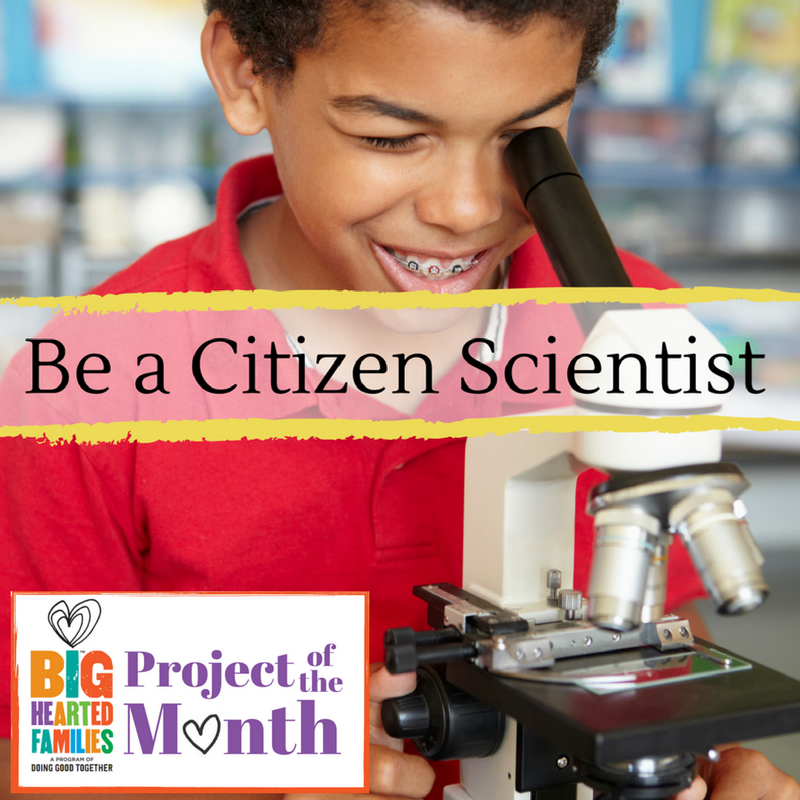 The truly great thing about citizen science through SciStarter is that you can choose a project based on your interests, the financial investment you're prepared to make, and your child's ability. Visit Doing Good Together's Be a Citizen Scientist project page for more ideas and resources. Help DGT Spread Kindness Online! Social media makes it easy to find and share DGT's messages of kindness and caring with others! Each day, on a variety of social media channels, we offer simple service project ideas, recommend big-hearted books, share inspiring stories, and suggest family-friendly websites. "Like" us on Facebook, check out our pinnable Pinterest page, and follow us on Twitter and Instagram. Don't forget to subscribe to our wonderful blog too! P.S. Did you know? We have a DGT Silicon Valley Facebook page just for you. Become a fan to learn about local events, news, and resources. EPAMade is a social enterprise that employs and trains single mothers from East Palo Alto to gain job and life skills needed for sustainable employment. We help empower single mothers through employment and job coaching. EPAMade is a social enterprise under LevMade, Inc., a tax exempt 501(c)(3) nonprofit that incubates and launches social businesses to level the economic playing field. On the first Saturday of each month we need volunteers help sort donations at our thrift shop. The National Kidney Foundation is the leading organization in the U.S. dedicated to the awareness, prevention and treatment of kidney disease for hundreds of thousands of healthcare professionals, millions of patients and their families, and tens of millions of Americans at risk. Volunteers are needed to help with set up, clean up, booth hosting and walk route volunteers. Ages: All ages are welcome to volunteer. There is a signed waiver required for minors that will be available at the event. Contact: Robyn Hayden, robyn.hayden@kidney.org, 415.543.3303. Contact Robyn if you're interested in volunteering. Click here to register as a walk participant. Musician Coordinators: Welcome musicians and direct them to their assigned locations. Keep an eye on public safety. Distribute programs. Occasionally poll the public on the event. Volunteer Coordinators: Stay at official event table on Lytton Plaza. Check volunteers in and out. Direct them to their assigned locations. Operate as communications center. Distribute programs. Respond to questions from the public and musicians. Program Distributors: Distribute programs for the event to the public downtown. Do you have knitting experience from beginner to advanced or have you ever wanted to learn to knit? Sunny View Retirement Community is joining the nonprofit organization Knitting to Make a Difference, and we would like to form an intergenerational knitting circle that creates scarves, hats, mittens and even blankets to be distributed to the homeless throughout the Bay Area. If you already have needles please bring them. We will also help supply the knitting materials to those that are getting started. All supplies and materials are donated. Time Commitment: Meeting times vary. Contact Julia for more information. Located on the campus of Kaiser Permanente Santa Clara Medical Center, JW House provides a warm, comfortable home away from home for families facing medical crises. Families and individuals whose loved ones are in area hospitals are welcomed into the JW House for rest and self-care during the day or overnight. Dinner is Served is one of the most popular volunteer opportunities at JW House. After a long day at the hospital, our guests look forward to coming "home" to find that someone has planned, purchased the ingredients, and prepared a delicious meal just for them. Volunteers who participate in the Dinner is Served program soon discover that their efforts go far beyond simply supplying a dinner. As families gather for dinner, a warm sense of community exists. It is a place where families can relax with one another and check in on how each other's loved one is doing. Thank you for making a difference for these families. Ages: All ages are welcome to volunteer. Minors need to be supervised by an adult. Groups, businesses and individual families are ALL welcome to participate. Contact: April Bignell, volunteer@jwhouse.org, 408.246.2224. The sign up calendar shows available dates in red. Please click on a red date, then on "Click here to submit your information." Then complete the form to request that date. Someone from our office will contact you soon to confirm the date you request. Date/Time: Flexible, however you must schedule your volunteer shift ahead of time. SHCS cannot take walk in volunteers. Register to become a new volunteer by completing the volunteer application online. Once you have submitted your application, you will receive an email from us with your personal user ID and password. Allow up to two business days for your application to be processed and to receive your user ID and password. All minors need to have the Parental Permission Form completed before volunteering. After registering to become a new volunteer you MUST SCHEDULE to attend one of our upcoming volunteer orientations. The information for orientations will be sent to you once you have submitted your application. Once you have attended the volunteer orientation you are able to volunteer! Contact: Sergio Gonzalez, volunteers@sacredheartcs.org, 408.278.2171. If you have any questions about becoming a volunteer or encounter any difficulties in the sign-up process please email volunteers@sacredheartcs.org. Volunteers are needed to help staff during activity time. You can assist individual seniors or the whole group. You can also share any talents or skills you may have to educate, entertain or empower the seniors. White Blossom Care Center is a skilled nursing and rehabilitation facility that strives to serve the greatest generation. The White Blossom Care Center healthcare professionals strive to help patients reach their maximum potential in a caring and supportive environment. Ages: All ages are welcome; good cheer and any talents to share are helpful! Contact: Pele, info@whiteblossomcarecenter.com, 408.998.8447. A Volunteer Application and brief orientation is required before starting. Date/Time: Three Saturday mornings each month, 9am to noon. Beautify San Jose's most blighted neighborhoods with homeless Downtown Streets Team Members who are working hard to get housing and employment. The mission of Downtown Streets Team is to eradicate homelessness by empowering homeless individuals to be part of the solution to homelessness. Join your community by beautifying the Santee, McKinley or Mayfair neighborhoods with Downtown Streets Team Members. Not only will you be beautifying one of the most blighted neighborhoods in San Jose, fostering a safe place for people to live and play, you will be volunteering side-by-side with people who are volunteering their way out of homelessness. Feel free to ask them questions and get a new perspective on what it's like to be homeless and living on a low income in Santa Clara County. Please wear covered shoes, pants, long sleeves and work gloves. Wear sunscreen and bring water to stay hydrated. For safety reasons please do not wear these items: no red or blue, no logos on hats/shirts and no numbers. Blue jeans are okay. All that's left to bring is your "Can-do" attitude and we'll be on our way to making our neighborhoods safer and more beautiful places. Ages: Youth under 18 are welcome to volunteer with a parent or guardian. 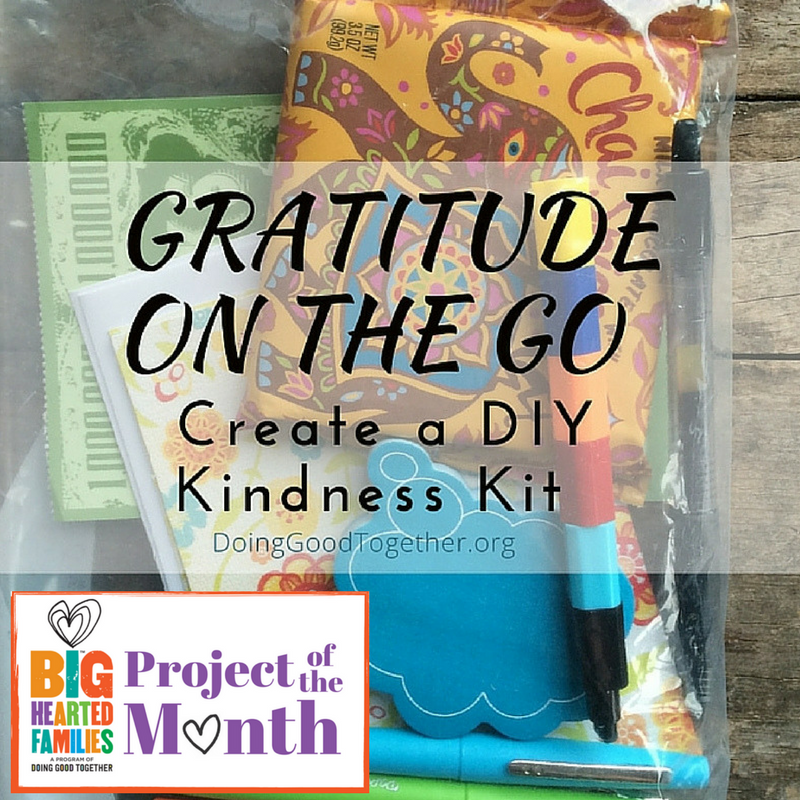 Read more about Gratitude on the Go and other Kindness Practices on the Doing Good Together website. Let your summer family gathering, school reunion, or community event be a chance for big-hearted giving. 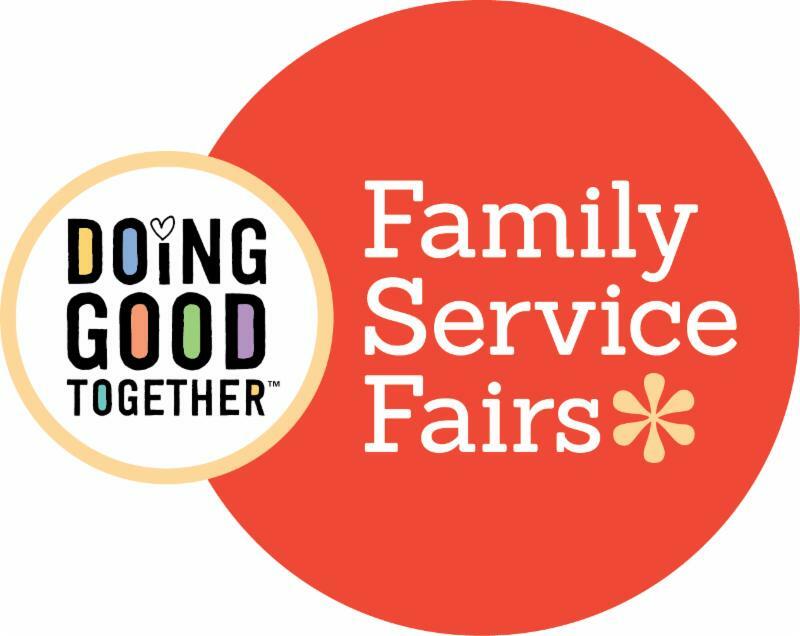 Our DGT Family Service Fairs are an are an ideal way for families to have fun while connecting with local nonprofits to help others in their community. And, our DIY Family Service Fair Manual makes them easy to host! to learn more about upcoming local volunteer activities and to find resources to help families raise caring and kind children. If you love nature, arts, science, writing, imagining and community, you'll love our Community Nursery Nature Journaling Events! Now more than ever, we need Citizen Scientists to chronicle our natural world. Together we share our curiosity and experience seeing our natural world in new ways. We'll explore the practice of nature journaling through the combined lens of artists, scientists, musicians, writers, multicultural visions, and naturalists. We will join the many Citizen Scientists who record the wonders of nature throughout the world for all to share in. No experience needed but is always appreciated. Please Bring: A pencil or pen and/or colored pencils, a journal or scratch paper and something hard to draw on (like a clipboard), reusable water bottle, close-toed shoes, sun or rain protection, a magnifying glass or binoculars, ruler, if you have them for close observations. Don't have any of this? No worries, we will provide art materials and paper. For 25 years, the Almaden Super Lions Club has sponsored the I CARE Classic Bike Tour to raise funds to provide eye exams and glasses for children and veterans in need. 100% of the event proceeds from rider registration are dedicated to that cause. The tour has courses for all skill levels: a 100-mile hilly course, a 100-kilometer course, a 50-kilometer course and a 20-mile course. This is a tour, not a race, and it makes for a great family outing! Ride through the spectacular spring scenery of Morgan Hill on well mapped, marked courses with great rest stops and SAG support along the way. All rest stops are well stocked with fresh fruit, home-baked cookies, trail mix, water, sports drinks and more. Refuel at the finish with a hearty barbecue chicken lunch and ice cream. info@icareclassic.org. To sign up, visit the Online Registration Page. Since 1964 Sacred Heart Community Service has served Santa Clara County residents in need. They provide food, clothing, job training, legal services, housing assistance and educational classes free of charge to more than 1500 clients each day. Join us to support Sacred Heart's programs by building food baskets, sorting clothing and food donations, and preparing educational materials for the clients. Volunteers must wear appropriate clothing (pants, no bare midriff or low cut shirts) and closed-toed shoes. The parking lot is often available for volunteers on Saturdays, please do not park in Wendy's or Denny's. Join millions of Americans on National River Cleanup Day to remove litter in our waterways. Litter found around the County parks and streets will eventually end up in our local creeks and rivers that flow out to the San Francisco Bay. You can make a difference in your community and for the whole Bay Area. Bring a friend and let's have some fun! No special skills are required for this event. Please bring a water bottle and sunscreen. Work gloves and pick up sticks are provided but you are welcome to wear your own. Ages: A parent or guardian must accompany volunteers age 14-15 throughout the event. Volunteers age 16-17 may participate without parent/guardian supervision but only if they present a completed volunteer application including a parent or guardian's signature. Application forms as available at the event but the parent or guardian must be present to sign. Spend a morning in May with Girls on the Run of Silicon Valley! We need over 200 race day volunteers to help ensure that all our 5K participants successfully reach the finish line. Come join the fun and become a 5K Volunteer today! Pass out T-shirts at packet pick-up, hand out Mardi Gras beads and water to runners and walkers along the course, award ribbons to finishers, and more. For detailed information on the many 5K volunteer roles and to register to volunteer visit the website. The Hayward Area Recreation and Park District, known locally as "H.A.R.D.,"is an independent special use district created to provide park and recreation services for over 280,000 residents. Since its creation, the District has provided residents with many beautiful facilities and parks, many of which have received national and state recognition for their design, innovation and beauty, as well as hundreds of educational and recreational classes and programs. Grab your work gloves and your goodwill; the salt marsh needs your help getting rid of the trash that has accumulated since our last cleanup. We will provide trash bags and have gloves to lend. To register visit the volunteer website and scroll down to Shoreline Trash Takers. There are many ways to keep your park beautiful! Litter is all around us. Soda cans, plastic bags, and cigarette butts litter the environment, harm wildlife, and threaten our local parks and the planet. Together we can make a difference one piece of litter at a time. No special skills are required for this event. Please bring a water bottle and sunscreen. Work gloves and pick up sticks are provided but you are welcome to wear your own. Ages: A parent or guardian must accompany volunteers age 10-15 throughout the event. Volunteers age 16-17 may participate without parent/guardian supervision but only if they present a completed volunteer application including a parent or guardian's signature. Application forms are available at the event but the parent or guardian must be present to sign. Come join Veggielution farms for weekly Youth Garden Activities. Every Saturday the whole family can enjoy gardening, crafting, and learning together in the Youth Garden. Participating in our Youth Garden activities is a great way to spend time with your children while exploring the garden, learning about healthy lifestyle choices, and discovering the exciting processes of the natural world - not to mention making new friends. This is a unique opportunity to get your hands dirty and become better stewards of the environment as a family. Veggielution volunteer activities encourage exploration and play-based learning for the whole family. Contact: Jennifer Aguilar, jena@veggielution.org or Dana Shinners, danas@veggielution.org. To sign up visit their Youth Garden web page. Date/Time: Sundays: Shifts available between 10:30am and 5:30pm. Also, there are some after-school shifts on weekdays at our special store. Ages: Teens, adults, families and groups are all welcome. An adult must accompany children under age 14. Contact: Volunteers should begin with the New Volunteer Registration process on the volunteer page. Please register to volunteer a couple of weeks in advance of the date. Contact Lilly, lillyp@sundayfriends.org, or Vanessa, volunteer@sundayfriends.org, with questions or call 408.217.9587. Volunteers are essential to Tri-City Volunteers food bank's daily grocery cart preparation and distribution. We need approximately 40 warehouse volunteers a day to ensure that as many as 350 client families per day receive adequate nutrition. Volunteers also help us sort and hang donated clothing and attractively merchandise our boutique thrift store, which provides very low-cost items to struggling families: babies clothes are 10 for $1.00, children's clothes are 5 for $1.00 and the majority of adult clothing is marked at $0.50 or $2.00. Community volunteers are the heart of our agency. Not only do volunteers work directly with low and very-low income families, they bring to life our vision of a community united together to ensure that every child and adult in our area is not just free from hunger, but can access pathways to financial stability and self-sufficiency. While volunteers assist families in Tri-City Volunteers food bank and thrift store, they are also mentoring and deeply connecting with others. That is the real strength of our work. Thank you to everyone who attended our April 20th Celebration and helped us raise funds to empower families to raise children who care and contribute! If you weren't able to attend our event, here's your chance to make an impact. Every $25 raised helps DGT™ engage with a new family who wants to share more acts of kindness and service. Those big-hearted efforts have a multiplying effect: As families do more good for others, they start a family routine of giving that benefits others now and in the future. Whether you want to support one family or several, your donation helps us multiply kindness and extend DGT's reach to families across the nation. Click here to make your donation. And to instill a habit of kindness and service in your own family, be sure to join our Membership Circle if you haven't already. 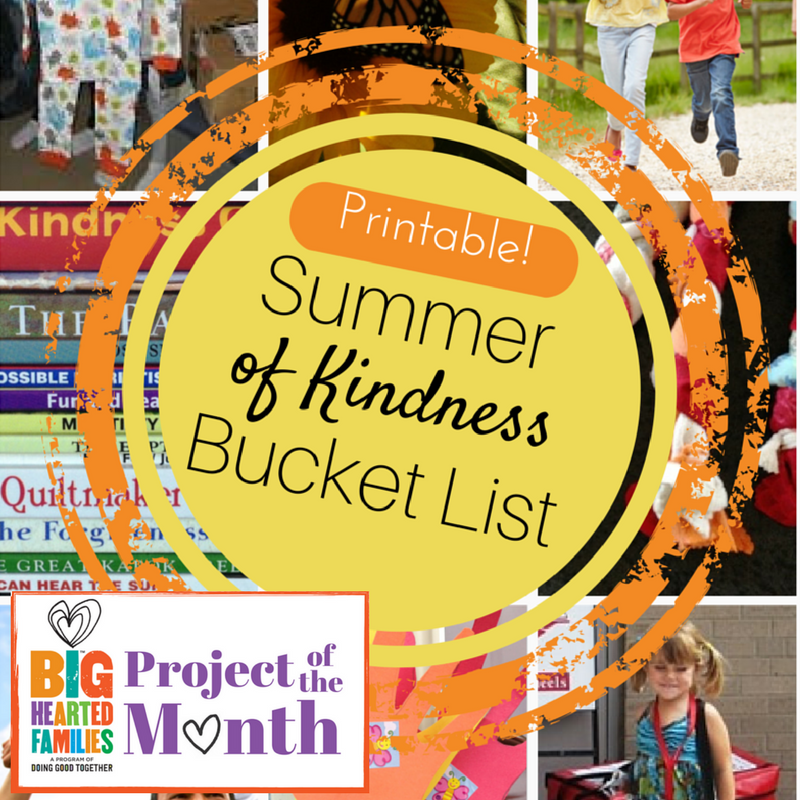 Print and post one or both of DGT's two innovative Summer of Kindness bucket lists. 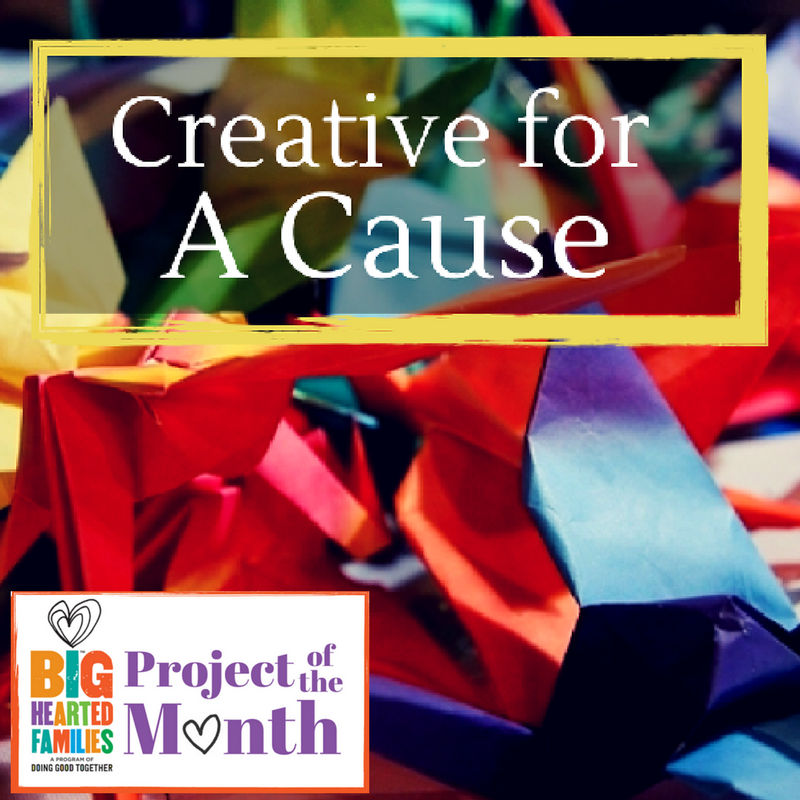 These creative kindness projects will keep your family making big-hearted memories all summer long. Time Commitment: 15 minutes to 1 hour per week depending upon the activities you choose to complete. Ages: Sunnyvale Park and Overfelt High School projects are available for ages 5 and older. All other projects listed are for ages 13 and older. At this time there is not a way to sign those children up on the website, so please just bring them with you to the site on the day of the project with a minor waiver. Volunteers are needed for help with registration, sports referees, photo booth, walk route monitors/cheerleaders, water monitors, booth monitors, set up/tear down, refreshments, rest area monitors and start/finish line cheerleaders! All volunteers receive an event t-shirt. Ages: Volunteer positions available for all ages. Contact: Nick Mourlam, Manager of Sponsorships & Special Events, NMourlam@ParkinsonsInstitute.org or 408.542.5637. Click to register as a volunteer or as a participant. Celebrate Earth Day by doing your part in keeping San Jose clean and green. Each District in San Jose is hosting its own event - please visit the websites below or contact your local District office for more details! District One Event: Hamann Park Community Room, 2747 Westfield Ave.
District Three Event: 438 Coleman Ave.
District Ten Event: Pioneer High School, 1290 Blossom Hill Rd. - Meet at back school parking lot; Vista Park, 465 Hyde Park Dr.; Comanche Park, Shawnee Ln. & Comanche Dr. Volunteers are needed for tree trimming, weeding, litter pick-up, spreading bark and other general cleanup. Lunch will follow. Family Supportive Housing helps homeless single- and two-parent families with children remain intact, while addressing their needs for food, shelter, employment and education. We offer families a respite, an opportunity to make life-altering changes, and a system to aid in finding permanent housing. Volunteers are responsible for setting up and serving dinner to our resident families. Without our volunteer dinner servers, residents would be required to serve the families as a chore. Thank you for allowing a resident to sit and enjoy dinner with his/her family and for your commitment to our vision of empowering homeless families. Ages: Ages 12 and up with an adult present. Ages 16 and up without adult present. Establish a relationship with a local retailer to pickup damaged food, cleaning products, toilet paper, or other staple household items on a regular basis. Buy new socks and/or gloves for the homeless. Feel free to wrap them and include a personal note (first names only please). Location: All throughout the Bay Area, currently mentors are most needed in Sacramento. Volunteers are matched with newly-arrived individuals and families to help answer any questions relating to American culture, customs, processes, laws, or community resources that would help their match feel more connected. Mentors help find solutions to needs such as finding a job, preparing for college, filing for FAFSA, fixing a car, or passing a driver's test; and provide opportunities to get out, explore surroundings, make new friends, learn a new skill or hobby, and connect to others within their communities. Ages: Families with an adult 18 or older are welcome to volunteer. Time Commitment: Eight to ten hours a month. In February 2017, during one of the wettest winters in decades, several San Jose neighborhoods experienced severe flooding that has forced thousands of residents and businesses to evacuate their homes and caused significant damage to public and private property throughout the city. The most severe flooding has taken place in neighborhoods along Coyote Creek, which includes a number of low-income communities and mobile home parks that were submerged when Anderson Reservoir reached its capacity and began spilling into the creek. You and your family can help with flood relief efforts by raising money for the San Jose Flood Victims Relief Fund. This fund will support nonprofit organizations providing immediate and long-term relief and recovery assistance to flood victims in San Jose. Visit the Doing Good Together Fun Fundraiser project page for ideas on how you can raise money as a family. While it will take some time to fully assess the damage caused by this emergency, we know that many families will require assistance in the weeks and months ahead. Your donation to the San Jose Flood Victims Relief Fund will help provide relief to those most in need. Not all acts of kindness require planning. Check out the Doing Good Together 24+ Quick Acts of Kindness project page for ideas. 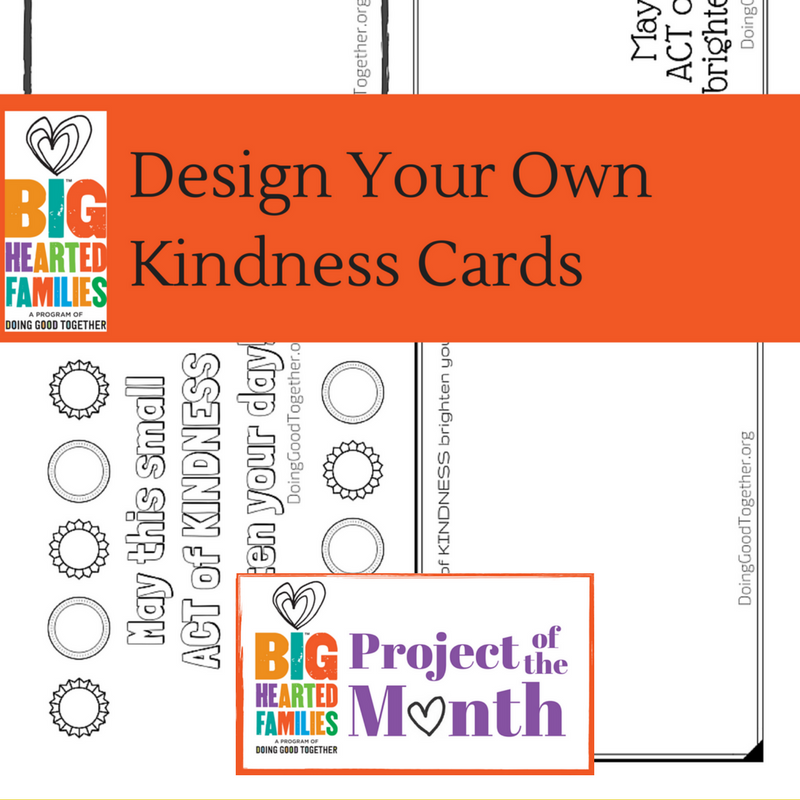 You can also print out our Design Your Own Kindness Cards to include with your quick kindness activities. DGT is proud to have amazing partnerships with a variety of organizations. Yours can be next! If your group or organization is interested in hosting a fun family service event, offering a workshop on raising caring kids, or in need of custom materials to introduce children and families to important social issues, we'd love to help. To learn more, contact Jenny by email (jenny@doinggoodtogether.org). Date/Time: Dates are available between March 1 - April 5, 6:30 - 8:30pm. St. Frances Cabrini Helping Others will be welcoming 15 homeless women into our community from March 1 to April 5, as part of the expanded Village House Network of rotating shelters. Families, groups and organizations can lend a hand by preparing, serving and cleaning up dinner. At least five volunteers are needed for this opportunity. Please be sure to prepare enough food for 25 people, plus enough for you and your volunteers if you wish to join the meal. We encourage volunteers to have dinner with those you serve that evening. Volunteers are asked to provide a well-balanced meal along with dessert and drinks (non-alcoholic). Please take all containers with you after the meal. Leftovers will not be able to be saved, as there is no space to store or refrigerate. There is a kitchen on site if you wish to cook the meal there or you can bring it heated. Ages: All ages are welcome to help with dinner service. All minors must have an adult present. Contact: To sign up please contact Maile Figone, rmfigone@sbcglobal.net or 408.483.0713. Please let Maile know what your main course will be when you sign up. Volunteer in your community to clean up Penitentia Creek Park! A variety of activities will be offered to restore and clean up the park area. Tools will be provided and no pre-registration is required. Follow in the footsteps of inspiring female environmentalists like Save the Bay's founders Kay Kerr, Sylvia McLaughlin, and Esther Gulick, by continuing their efforts to restore healthy shorelines to San Francisco Bay. Join us at our Palo Alto Baylands nursery and see what it takes to grow the next generation of native plants that will help reestablish healthy wetlands throughout the Bay. No experience necessary. Gloves, tools and instruction provided. Each event is led by Save The Bay staff who are certified in first aid and CPR. Contact: Rachelle Cardona, rcardona@savesfbay.org, 510.463.6850. Due to the sensitive nature of the restoration site, space is limited and RSVP is requested. You must fill out the online registration form to register yourself or a group of 10 people or less. Join us to plant, maintain, and harvest our community and educational garden in East Palo Alto, while enjoying being part of our community. Monthly Saturday Workdays are also a potluck so bring a dish to share and enjoy lunch under the oak trees! We invite you to a Coyote Creek cleanup for World Water Day. Keep Coyote Creek Beautiful invites you to spend a few hours at Coyote Creek and help beautify our creek through a community cleanup. Improve your Trash Karma by participating! Volunteers are needed to help with registration and photos as well as participate in the cleanup. Be sure to wear long pants, sleeves, and closed-toed shoes since you will be near poison oak and around loose or muddy soil. Ages: All ages welcome, minors under 18 require signed waiver. An adult must accompany volunteers under age 13. Contact: Deb Kramer, Program Manager, deb@keepcoyotecreekbeautiful.org, 408.372.7053. Registration is available online. We suggest you also check with Keep Coyote Creek Beautiful close to event day to ensure that the recent flooding hasn't changed the event details. Stanford Health Care invites you to join us for the Fourth Annual Racing Hearts 5k Run/Walk and 10K Run benefiting Stanford Heart Research and the Stanford Center for Inherited Cardiovascular Disease! We need volunteers for both before the race and day of the race. Volunteer needs range from flyer distribution, check in, course marking, course support/cheering and clean up. Ages: Age minimum varies by shift/role but there are many opportunities for children of all ages! Contact: Rachel Acuna-Narvaez, RacingHearts@stanfordhealthcare.org, 650.380.1191. Please register each volunteering member of your family on the Racing Hearts Event Site and make a note to let organizers know that you will be volunteering as a family and any specific preferences. Date/Time: Wednesdays, 5 - 6pm for the Hot Meal Program, other volunteer opportunity days and times vary. The Ecumenical Hunger Program, along with the St. Vincent De Paul Society, prepares and serves hot meals to needy individuals and families every Wednesday night at St. Francis of Assisi Church in East Palo Alto. At St. Francis, you'll be serving pre-made food to the less fortunate. When volunteers arrive, they sign in, grab aprons and gloves to either prepare the plates or go out and serve the plates to the guests. Some of those served are homeless, while others are families with children who take advantage of this program to conserve the limited funds they have. There are also opportunities for families to volunteer in the Food Closet (sorting, packing and distributing boxes), and in the warehouse (sorting clothing, shoes and other items). CureSearch raises funds for children's cancer research to ensure that more children have access to life-saving treatments today and into the future. Ultimate Hike: Create Your Adventure is your chance to plan your lifesaving adventure from start to finish. You pick the trail, the distance, the date, and you set your own fundraising goals. All you need is a trail and your own two feet, and every step you take will make a difference! From the main Create Your Adventure page, click Register in the navigation bar at the top of the page and choose whether you want to register "As an individual", "As a Team Captain" (to start a new team), or "As a Team Member" (if the team already exists). You will then have the chance to start a new adventure! Webster House welcomes volunteers of all ages to come spend time with residents doing various therapeutic recreation activities such as singing, reading, arts and crafts, jewelry making, bowling, gardening, and much more. We also have volunteer opportunities for one-on-one visits to residents in their rooms, dining room assistance, assisting residents with their meals, and musical performances. Time Commitment: Varies. Webster House would like to have volunteers weekly or more, if possible. Location: Check the national Homeless Shelter Directory or Emergency Food Programs Directory for shelters or soup kitchens in your area. Your family can work together to help hungry people in your community by volunteering to cook a meal or bring food to a local homeless shelter or soup kitchen. When you contact a shelter or soup kitchen, ask for the volunteer coordinator, see if they need volunteers and ask if they have any age requirements. 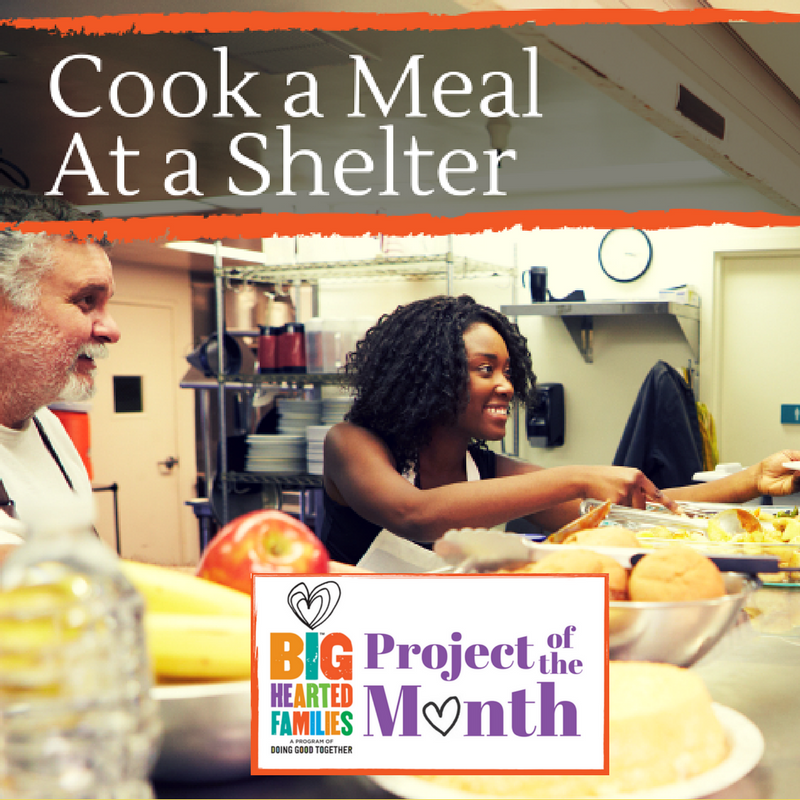 Find more information and resources on the Doing Good Together Cook a Meal at a Shelter Project Page. Ages: Will vary depending on the shelter or soup kitchen's volunteer policy. Time Commitment: Varies; volunteers can typically make either a one-time or ongoing commitment. One of the hallmarks of DGT™ is that we do more than simply offer opportunities and ideas for sharing kindness and serving others. We also expand on those experiences with important tips that help families prepare for and reflect on the unique situations they encounter during their time spent volunteering. Our newest Reflection Activities are geared specifically to the frequent topics we cover in our listings, e.g. helping the hungry and caring for animals. Look for the reflection banners in our listings to find conversation starters, book recommendations and more. And be sure to bookmark this collection of reflection offerings for easy reference during big-hearted discussions with your family. The Almost Eden Garden Project grows quality organic produce for local organizations that provide meals and services for homeless and low-income families. During our harvesting seasons (late summer and early winter), weekly deliveries are made to St. Anthony's Dining Room in Redwood City and to the South Palo Alto Food Closet. Garden tasks may include laying wood chips on walking paths, planting seedlings, weeding, digging and amending garden beds, trimming and/or turning compost bins. Be prepared to get dirty, bring your own reusable water bottles, and wear closed-toed shoes please! Ages: Families with children ages five and older are welcome to volunteer. All minors under the age of 16 must have adult present. Kick off Super Bowl Sunday with the annual Super Guadalupe River Run benefiting Guadalupe River Park Conservancy. Don't fumble the opportunity to burn some calories. Whether you go long for 6.2 miles or tackle the 3.1-mile quarterback sneak, you'll earn your game-time guacamole on the Guadalupe. Huddle with family, friends, training partners, neighbors, co-workers to run a 10K or 5K - cross the goal line to score guilt-free indulgence during the game. Not interested in racing? Volunteers needed to cheer our participants along the course! Contact: Jessica Gonzalez, jessica@grpg.org, 408.298.7657. Click here for race registration and click here for volunteer registration. During winter the San Francisco Bay Area provides a temporary home to over 1.6 million migrating shorebirds. These birds are dependent upon the health of wetland vegetation, which Save The Bay aims to bolster by planting 40,000 native plants this winter along the shoreline. Come out to the Palo Alto Baylands and bird watch as you plant, while providing healthy habitat for our feathery friends. No experience is necessary. Gloves, tools and instruction provided. Save The Bay staff certified in first aid and CPR will lead the event. Ages: All ages are welcome with an adult. A parent or guardian must accompany children under the age of 16. Contact: Rachelle Cardona, Restoration Education & Community Engagement Specialist, rcardona@savesfbay.org, 510.463.6850. To register, visit the Save the SF Bay Volunteer Registration Page. Space is limited and an RSVP is required. Date/Time: Times and dates are flexible for volunteering. Upcoming orientations are Monday, February 6, 6 - 7:30pm or Friday, February 24, 10 - 11:30am. There With Care provides a wide range of thoughtful and fundamental services to children and families during the critical phases of a medical crisis. They serve families referred by medical agencies by building a network of services and people who ease the burden of life's day-to-day obligations with compassion and care. Help care for the families of critically ill children in your community by delivering groceries and needed items to them. Volunteers must attend a one-time mandatory 90-minute training before heading out with grocery and supply deliveries from our pantry in Menlo Park to families on the Peninsula, Lucile Packard Children's Hospital, and Ronald McDonald House. Please bring your children of all ages to help you volunteer! Ages: Families with children are welcome; primary volunteer must be 18 or older. A drivers license, background check and orientation is needed for drivers meeting with families. Date/Time: Wednesdays and Saturdays from 10am to 7pm or dark, whichever comes first. Full Circle Farm's Education Garden is a one-acre patch of green at the west end of the farm. The garden meets a number of community needs while the farm at large is focused on locally-grown food production. Designed to enable easy access by children of all ages, the garden provides a space for youth groups from preschool up through middle school. We have a Children's Garden space available and many of our volunteers come with their entire family. Volunteers help with gardening tasks including cultivating, harvesting, planting, compost work, and more! Volunteers are essential to Tri-City Volunteers food bank's daily grocery cart preparation and distribution. We need approximately 40 warehouse volunteers a day to ensure that as many as 350 client families per day receive adequate nutrition. Volunteers also help us sort and hang donated clothing and attractively merchandise our boutique thrift store, which provides very low-cost items for struggling families: babies clothes are 10 for $1.00, children's clothes are 5 for $1.00 and the majority of adult clothing is marked at $0.50 or $2.00. Community volunteers are the heart of our agency. Not only do volunteers work directly with low and very-low income families, they bring to life our vision of a community united together to ensure that every child and adult in our area is not just free from hunger, but can access pathways to financial stability and self-sufficiency. When volunteers assist families at the Tri-City food bank and thrift store, they are also mentoring and deeply connecting with others. That is the real strength of our work. The Play Space is a program of Playing at Learning - a home for all FIRST programs in Northern California, including FIRST Robotics Competition, FIRST Tech Challenge, FIRST Lego League and JR. FIRST Lego League. The Play Space is a space for interested students to learn about engineering, technology, robotics, and more as well as a space for volunteers to learn and for all to play! Playing At Learning has a large collection of used FIRST LEGO League field kits that are comprised of LEGO pieces. These are in partial disassembly. On Thursday evenings each week, we are hosting a DisAssembly party - to get all of the partially disassembled LEGO elements back into separate LEGO pieces, i.e. fully disassembled. This is a great opportunity for a family to come and spend a few hours volunteering. Ages: Families with children ten years and older are welcome to volunteer. An adult must accompany all minors. Contact: Volunteers must RSVP so that we can get the LEGO kits out and ready for disassembly. To RSVP or ask any questions, email volunteer@playingatlearning.org. Since 1964 Sacred Heart Community Service has served Santa Clara County residents in need. They provide food, clothing, job training, legal services, housing assistance and educational classes free of charge to more than 1500 clients each day. Join us to support Sacred Heart's programs by building food baskets, sorting clothing and food donations and preparing educational materials for the clients. Volunteers must wear appropriate clothing (pants, no bare midriff or low cut shirts) and closed-toed shoes. Parking lot is often available for volunteers on Saturdays, please do not park in Wendy's or Denny's. Ages: Ages 9 and up. Kids ages 14 and under must have a parent or trusted adult present to volunteer. Contact: Sergio Gonzalez, volunteers@sacredheartcs.org, 408.278.2171. Date/Time: Bring breakfast or dinner. Meals should be delivered by 7:30 - 7:45pm. Location: 484 E San Fernando St, San Jose. Please park in the lot behind the home at 132 South 10th Street and enter the double glass doors behind the church building. Call Phil when you arrive at 408.839.9815. Grace Baptist Church has 35+ shelter guests that sleep inside the church every night. This is a great opportunity for you and some friends to come together to volunteer because you will be bringing a meal for approximately 50 guests and volunteers. You are welcome to drop off the meal or stay and serve and/or eat with guests. The church does not have a full kitchen so food needs to be brought cooked/warm for dinners. Guests love warm dinners of all kinds. There is a refrigerator and so anything cold (yogurt, fruit, hard boiled eggs) is great for breakfast. Hot water is also available for oatmeal packets. The shelter can always use more ground coffee/tea, sugar and creamer as well as disposable utensils and plates. Time Commitment: Flexible - you can drop off the meals or stay and serve/eat with the guests. Contact: Phil, 408.839.9815, email@graceinsanjose.org. To sign up visit: http://vols.pt/w5AqL1 (users will need a free account to sign up). Ecumenical Hunger Program, along with the St. Vincent De Paul Society, prepares and serves hot meals to needy individuals and families every Wednesday night at St. Francis of Assisi Church in East Palo Alto. At St. Francis, you'll be serving pre-made food to the less fortunate. When volunteers arrive, they sign in, grab aprons and gloves to either prepare the plates or go out and serve the plates to the guests. Some of those served are homeless, while others are families with children who take advantage of this program to conserve the limited funds they have. There are also opportunities for families to volunteer in the Food Closet (sorting, packing and distributing boxes), and in the warehouse (sorting clothing, shoes and other items). Ages: All ages welcome, please make sure that you are not sick when you come to volunteer. Date/Time: Three Saturday mornings each month, 9:30am to noon. Contact: Cliff Navales, San Jose Project Manager; cliff@streetsteam.org. Registration is available online. Your family can create these colorful bracelets to share with others. Making friendship bracelets for new students, or kids who seem to need more friends, is the perfect activity for the Valentine's season! 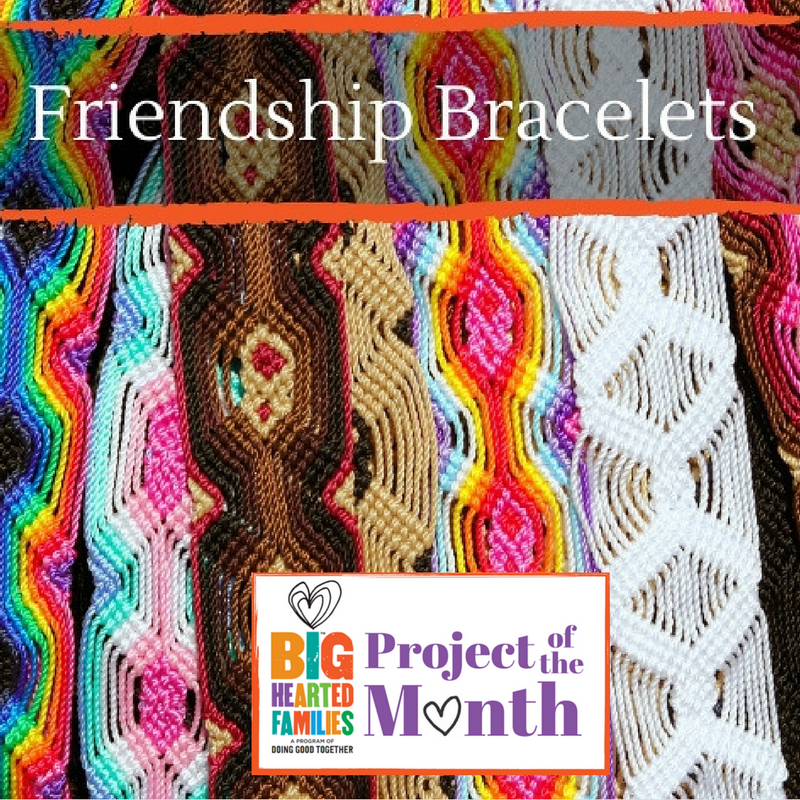 Visit the Doing Good Together Friendship Bracelets Project Page to learn how to make the bracelets and for reflection materials and resources for this kindness activity. Have you and your family used our DGT™ resources to share kindness and/or serve others? We want to hear from you! Take part in our STORIES FOR STORIES giveaway. We'll send a DGT-selected big-hearted book to the first five families who share their stories (via the form on this page) along with a photo or video! (Submitted stories may be used on the DGT website and/or social media.) Deadline for submissions: February 15th! P.S. Remember, your family's act of kindness and service *must* come from a DGT web page, listing, newsletter, or blog. Location: San Jose Municipal Rose Garden, Naglee Ave. & Dana Ave. San Jose. There is free parking on surrounding city streets. Volunteers will be helping to prune 3,500 rose bushes at the Rose Garden. Many helping hands are needed, so please bring your family and friends! Or simply come and meet others who enjoy volunteering at the Rose Garden. Everyone is welcome (6 years old and up) to participate in this dynamic San Jose volunteer event! No experience necessary--we'll begin with a training on how to prune roses. If you have hand pruners and garden gloves, please bring them. We will have a limited amount of tools available. Please wear closed-toe shoes and dress in layers, as the early morning dampness can be chilly. Roses are naturally thorny--wear long sleeves and clothes that can get a bit dirty! Bring a filled water bottle--we like to be 'green'! Please wear sunscreen as the roses are in the full sun. High School community service hours will be given. Food Trucks will be available afterwards. Stay and enjoy the peacefulness of the barren park. The event goes on, rain or shine! Los Gatos Creek (Bascom Ave.) Parking is just north of Hooter's Restaurant in the business complex at 1475 S. Bascom Avenue. Please park on the north end of lot and take bike trail access down to the creek trail and sign-up table. Los Gatos Creek (Auzerais Ave.) Parking is on the street. The cross streets are Wright Place and Auzerais Avenue where our sign-up table will be adjacent to the entrance of the bike trail next to Los Gatos Creek. Volunteers will participate in a creek and trail cleanup at one of two locations. Please bring your own water container, which we will fill for you. SBCCC supplies gloves, pick-up sticks and miscellaneous tools. Please wear long pants, hat, and sunscreen - be ready to spend the morning in light to moderate work. We have work for all ages and physical ability levels. Contact: Carol, 408.529.4460. Registration is available online. Volunteers are key to maintaining our community's urban forest and shaping neighborhood character. We welcome everyone with an interest in community and trees; no green thumb or previous experience required! Join Canopy to plant trees in honor of Martin Luther King Day of Service at Jack Farrell Park. The planting event will also include a Ceremonial Mayor's Tree Planting with the East Palo Alto mayor. Contact: Uriel Hernandez, Community Forestry Coordinator, uriel@canopy.org, 650.964.6110. Registration is available online. Join hundreds of your neighbors for a community-wide day of "tikkun olam" ("repair of the world") as part of a National Day of Service to honor the life and legacy of Dr. Martin Luther King, Jr. This intergenerational event will feature a range of hands-on service projects; participants will work in small groups on projects addressing issues of poverty, hunger, housing and homelessness, aging, the environment and more. We look forward to working with you to promote Dr. King's legacy of tolerance, peace and equality and increase our community's commitment to service and justice. This fun and inspirational day will leave you feeling accomplished and energized! Ages: Everyone is welcome to participate. Come on your own or with your family and friends! We ask that a parent accompany any volunteers under the age of 15. Volunteer projects are organized by age, please check website for details. Contact: Robin Vasilakos, rvasilakos@paloaltojcc.org, 650.223.8791. Pre-registration is required and space is limited in each service project. Registration is available online. Project READ fuels the fire of hope through literacy. We believe literacy is not only a human right, but also a necessity - a gift of opportunity and hope for the future. Our innovative intergenerational programs bring literacy to the adults, youth and families in our community. Our programs are designed to break the cycle of illiteracy by surrounding families with literacy services that promote education and a lifelong love of learning. Project READ provides a fun night for families with puppet shows, songs, crafts, snacks and a book to take home. Volunteer duties include anything from preparing craft samples and snacks to helping a child pick a book to add to his/her home library. You and your family can help Sunday Friends by organizing and running a Basic Necessities Drive throughout your school, club, church, synagogue, neighborhood, family or other community. Sunday Friends makes it possible for very low-income families in our community to earn tickets and then select and purchase their own items! They need diapers, toiletries, dish soap, laundry detergent, school supplies, etc. Sunday Friends can provide child-decorated collection boxes, customizable flyers, party ideas, prizes and more to help you with your drive. Check their website for more ideas. Town Cats is looking for volunteers of any age to host food drives. Volunteers identify a storefront in their area (such as a grocery store, pet store, or hardware store) where they can hand out flyers to raise awareness about Town Cats, and tell people that we are collecting cat food and kitty litter to benefit both our kitties that are in foster care in private homes or in one of our adoption centers. Town Cats also needs volunteers of any age to distribute flyers. You may post these in store windows (with management permission), post on public bulletin boards, or walk around and hand them out to people on the sidewalk at shopping centers, etc. NOTE: It is illegal to leave these in people's mailboxes or on car windshields, so please don't do that. Contact: Marcie Monteleone, volunteercoordinator@towncats.org. If interested, please fill out the Volunteer registration form. Random Acts of Flowers recycles flowers from the floral industry, as well as local companies, florists, grocery stores, funeral homes, and events like weddings. We turn these flowers into beautiful bouquets and deliver them to those struggling with injury, illness and the aging process every week in neighborhoods all over the country. Random Acts of Flowers improves the emotional health and well being of individuals in health care facilities by delivering recycled flowers, encouragement, and personal moments of kindness. Volunteering at Random Acts of Flowers helps us spread joy and allows people to nurture a culture of compassion and care. Volunteers range in age from elementary students to retirees. Individuals and groups - including schools, church groups, civic groups, businesses and even sports teams - make up the more than 2,000 people who share their time and talent to bring flowers and moments of joy to those in area hospitals, hospices, and health care facilities. Date/Time: This is a great project to begin in the New Year, but you can start anytime.